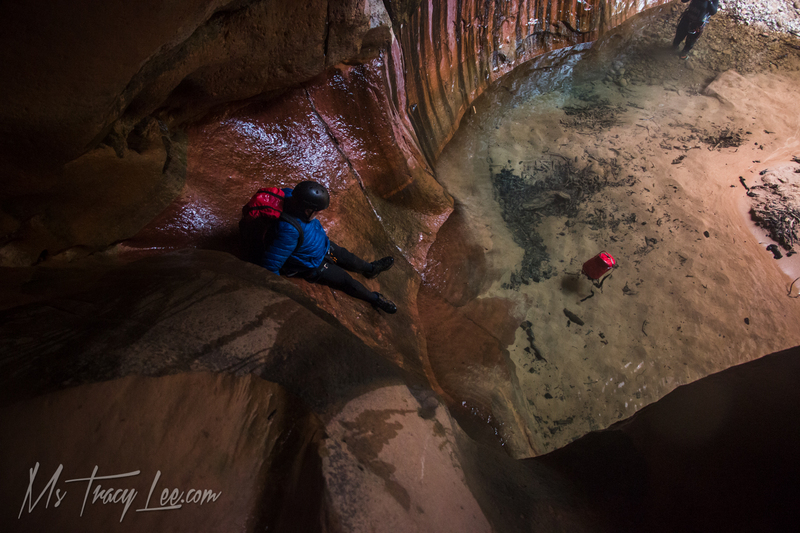 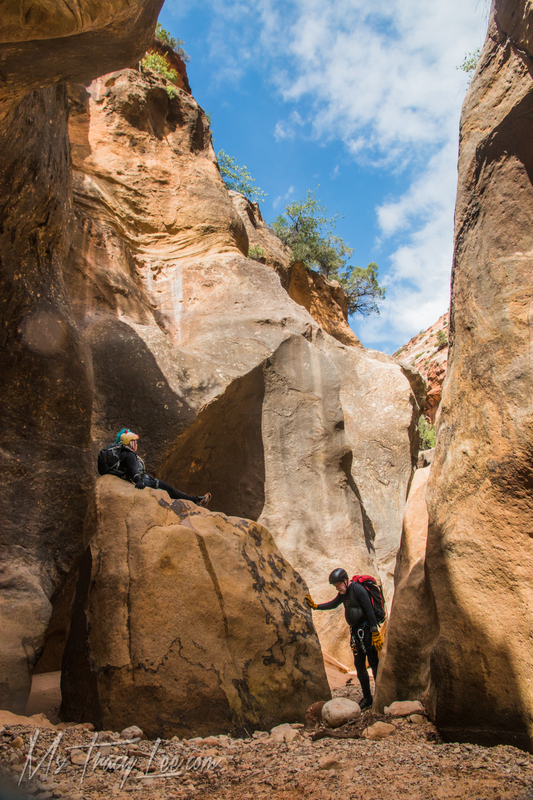 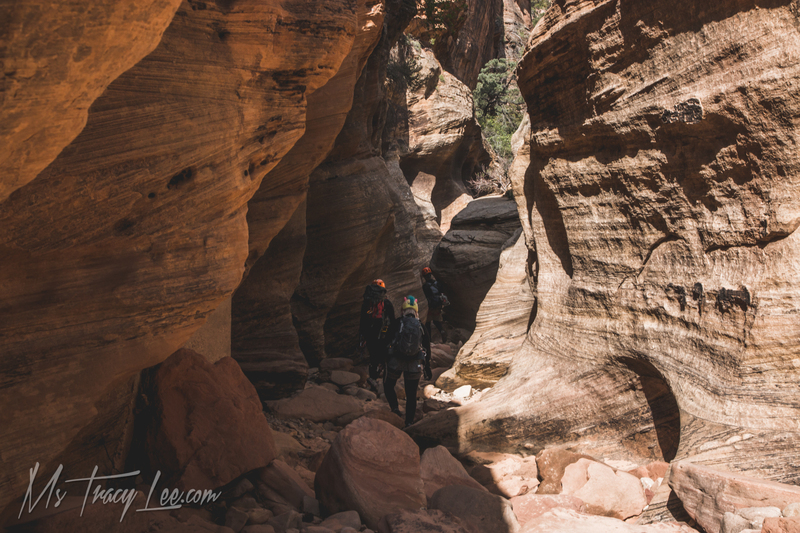 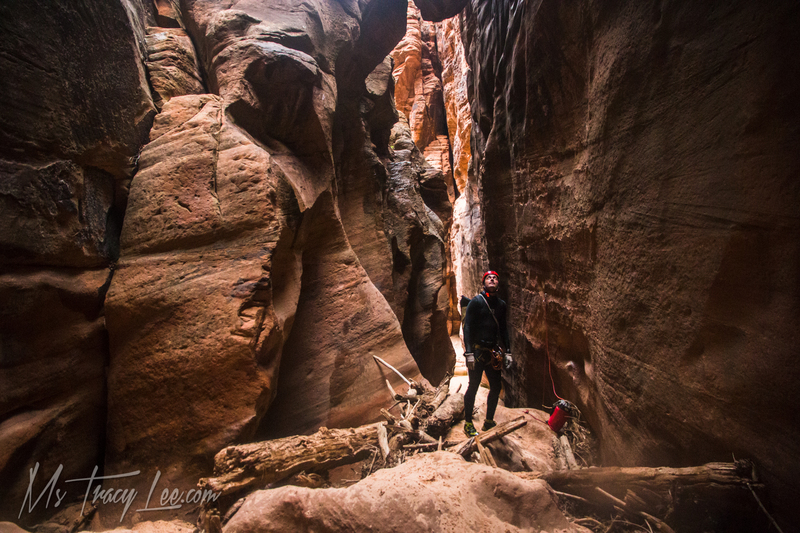 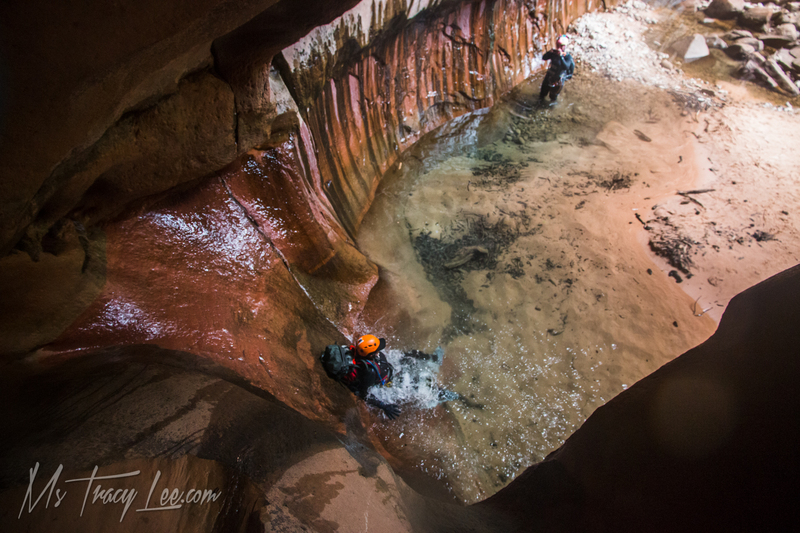 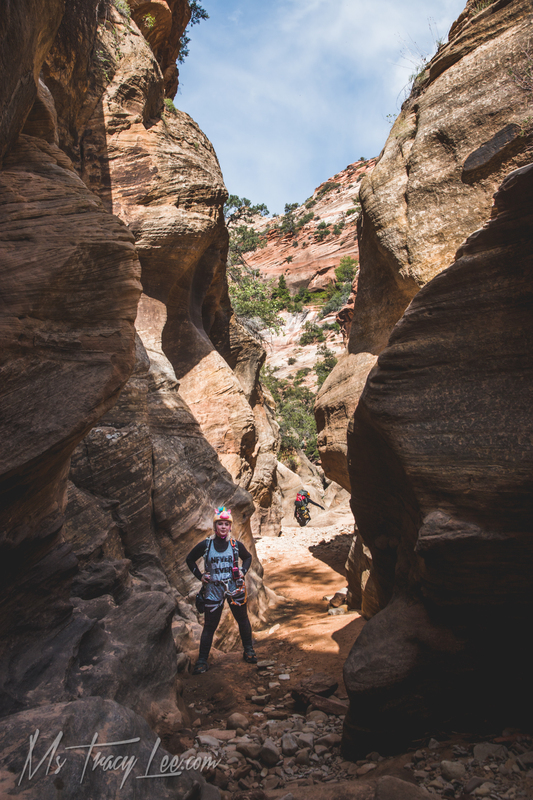 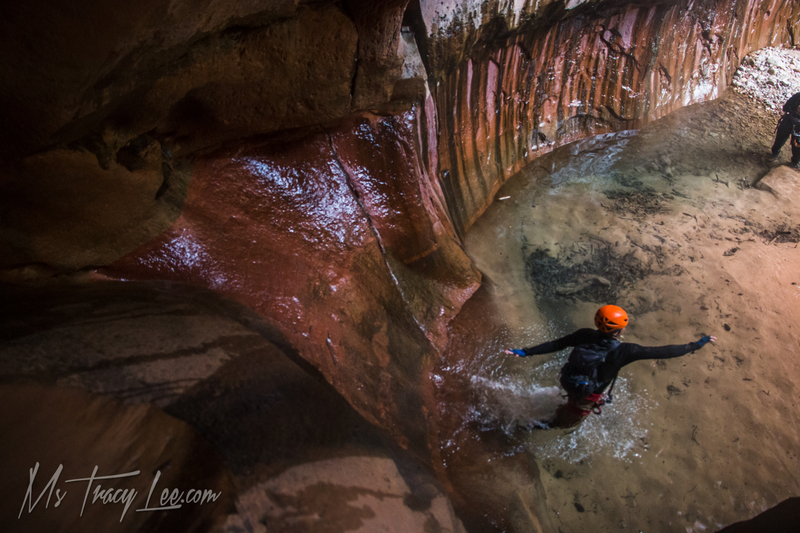 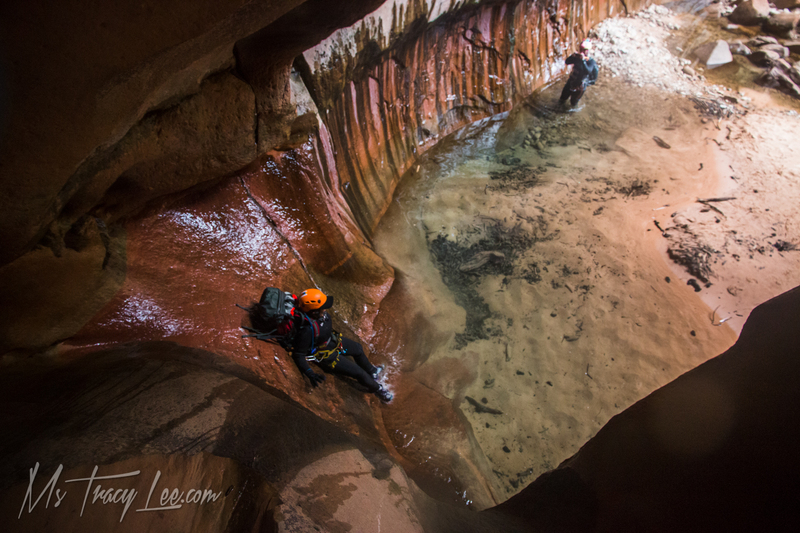 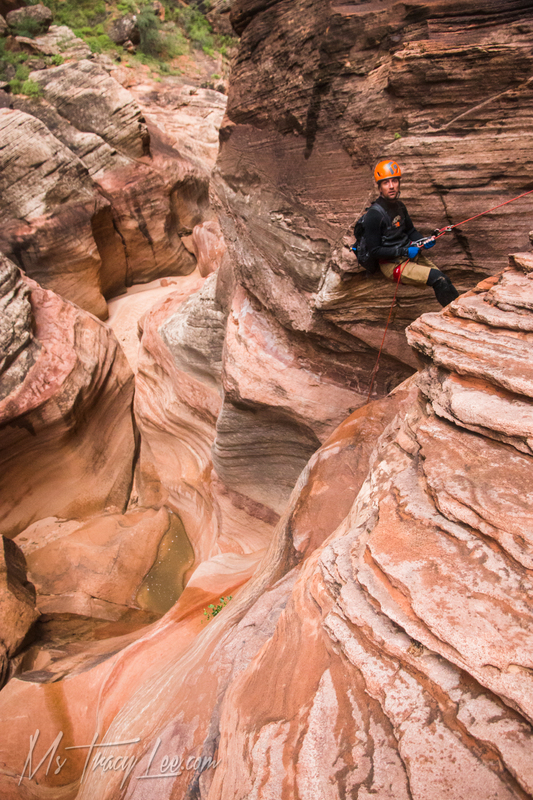 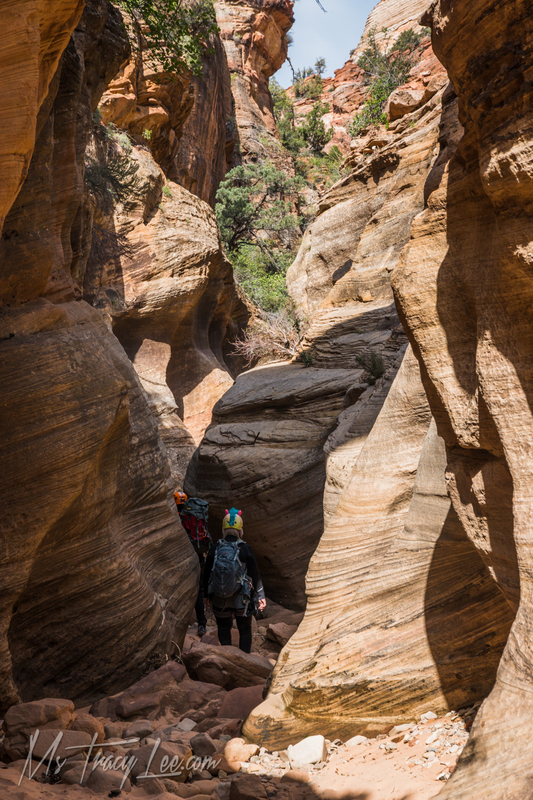 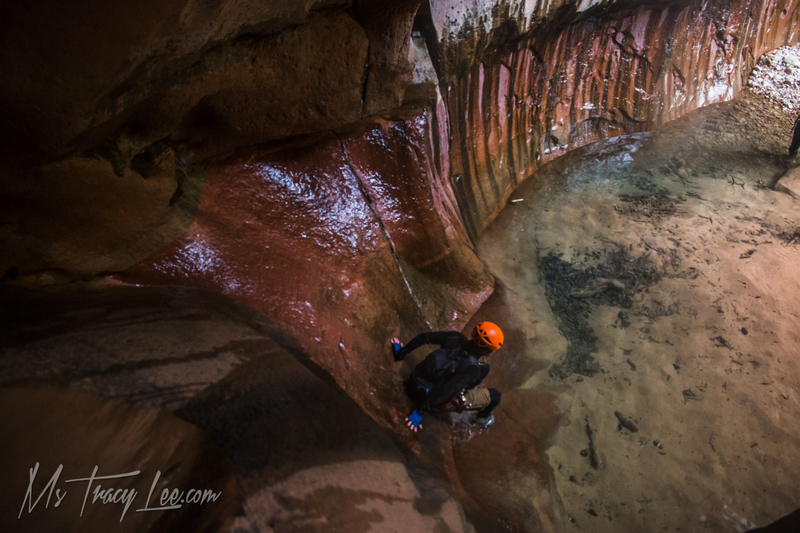 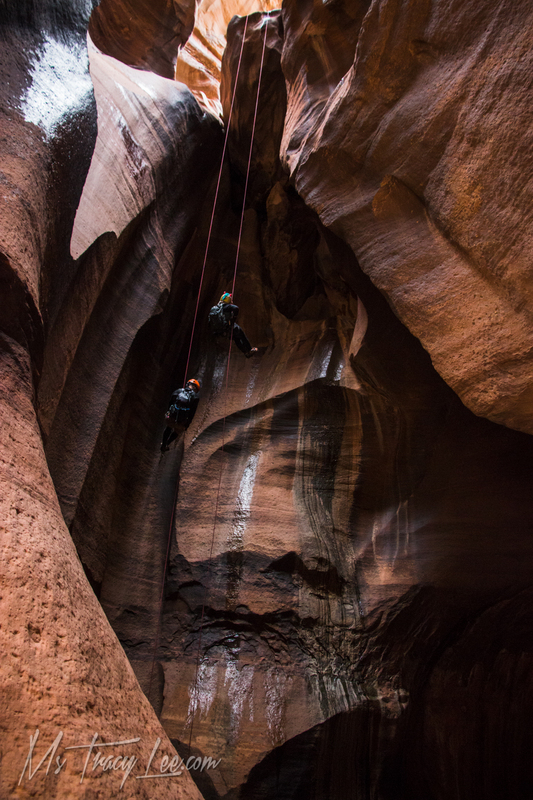 Questionable Weather for Pine Creek and Keyhole Canyon in Zion had us rearranging our day a couple Thursdays ago when we headed up to Zion to pick up our permits. 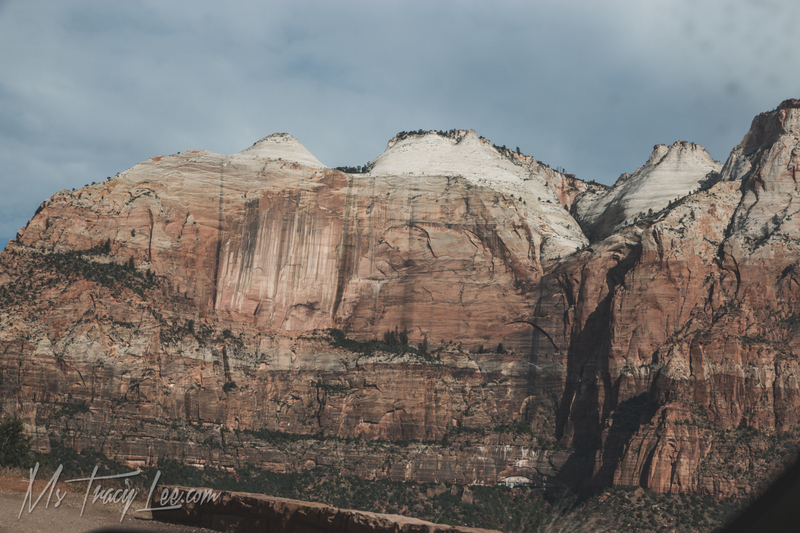 The weather forecast was predicting a 15% chance of rain until 12pm, and after that a 25% chance. 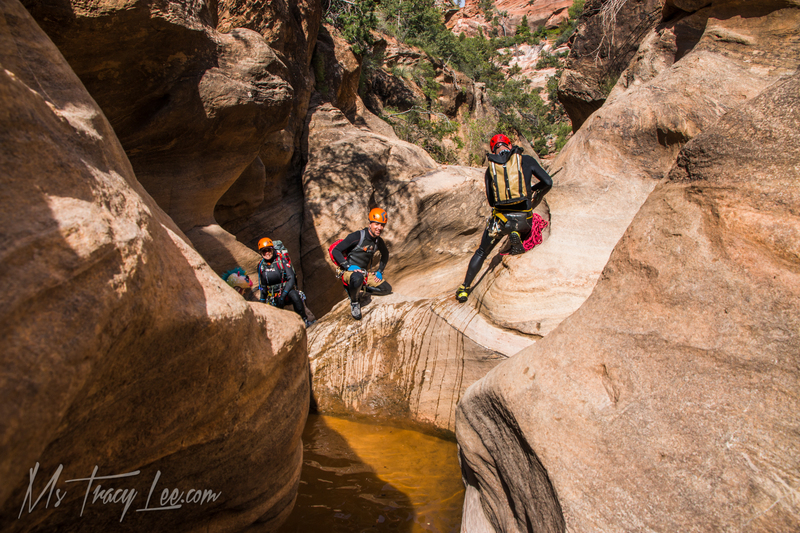 We consulted as a group (there were 6 of us on this trip) and decided if we only had time to do one, it was going to be Pine Creek. 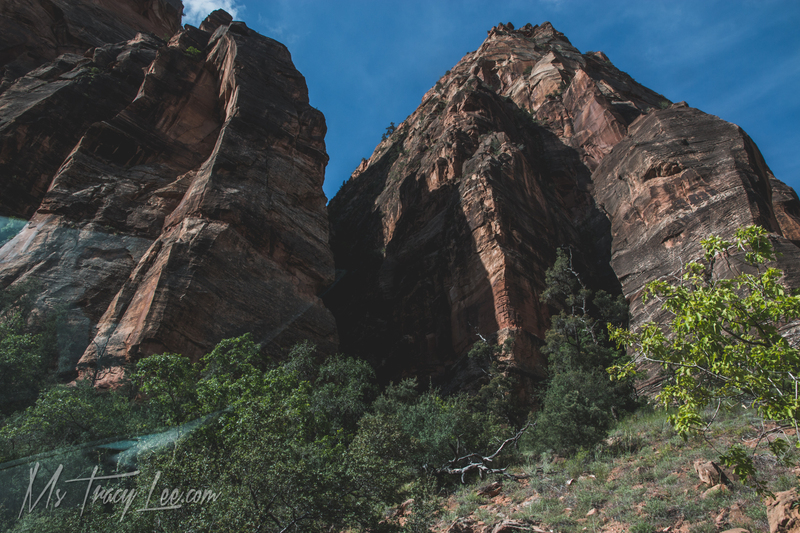 So we dropped off Sarah's car at the bottom, and all 6 piled into Jack's car up to the top shuttle point after the tunnel. 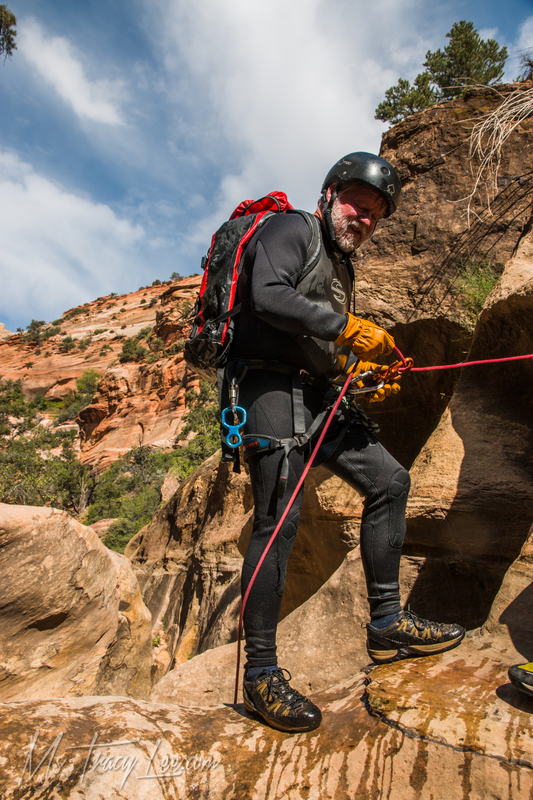 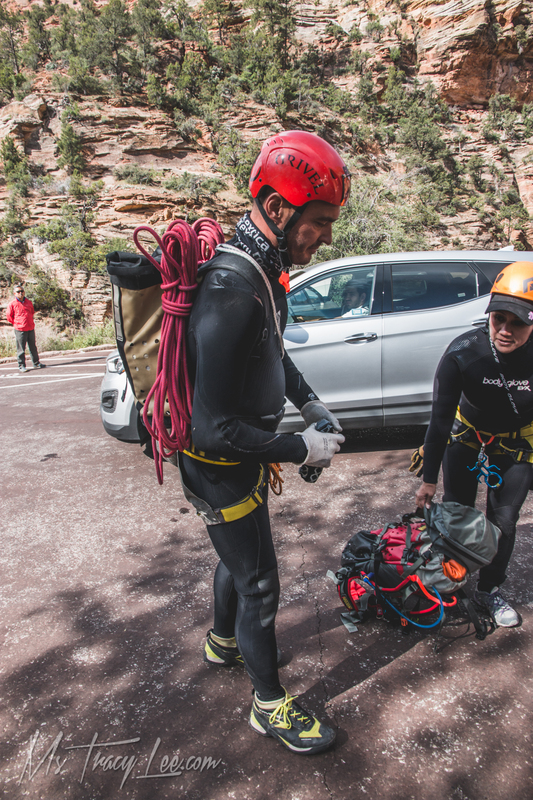 We managed to grab a parking spot in the tiny parking lot and spent the next 30 minutes gearing up into our wetsuits and getting our packs and harnesses ready. 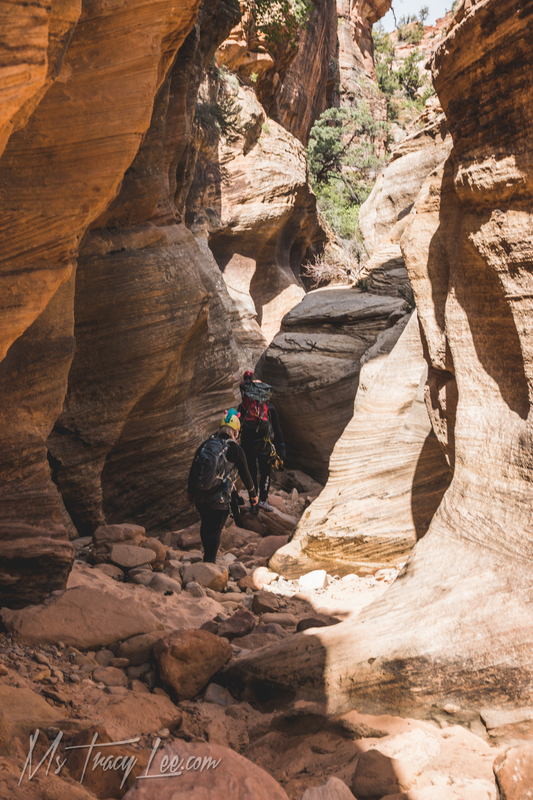 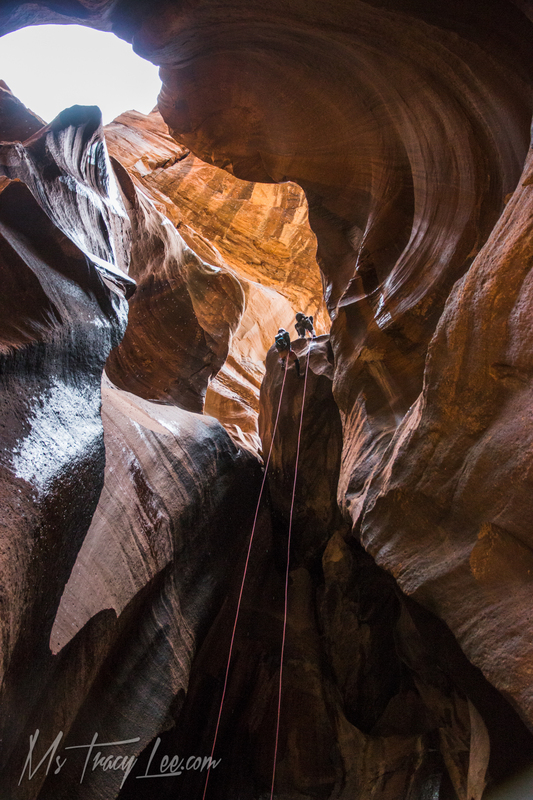 It was a short enough canyon that we didn't even bring lunches with us. 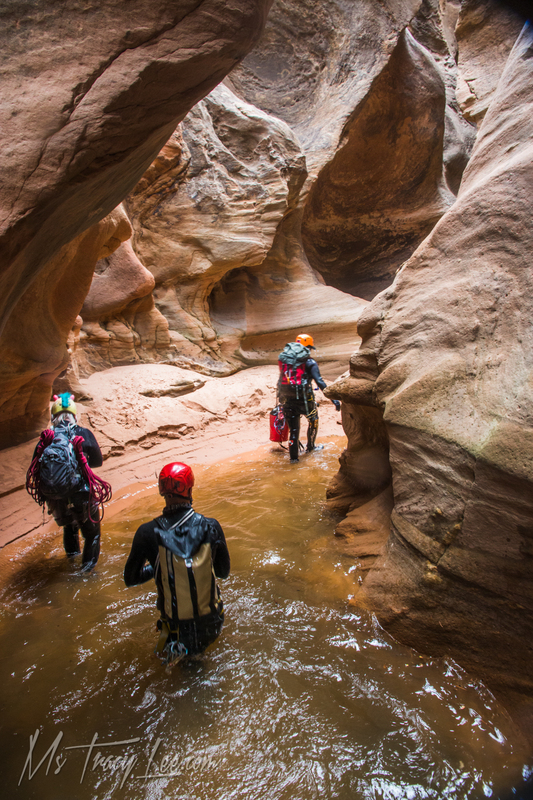 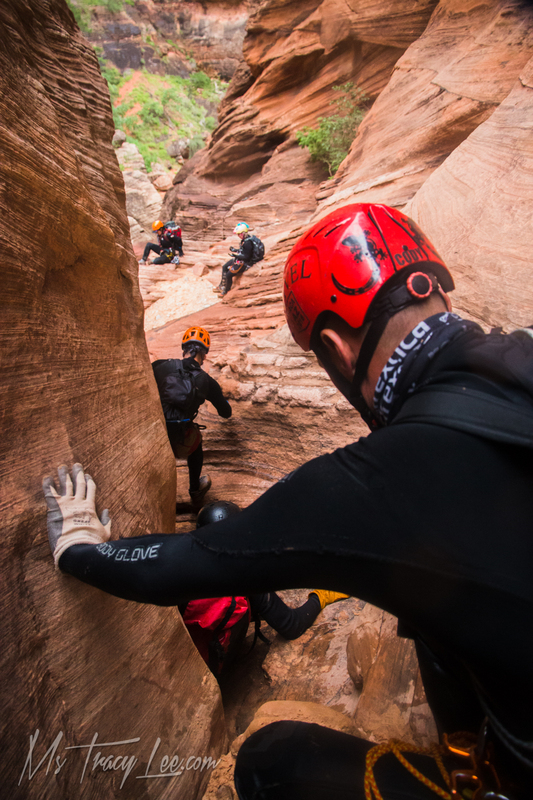 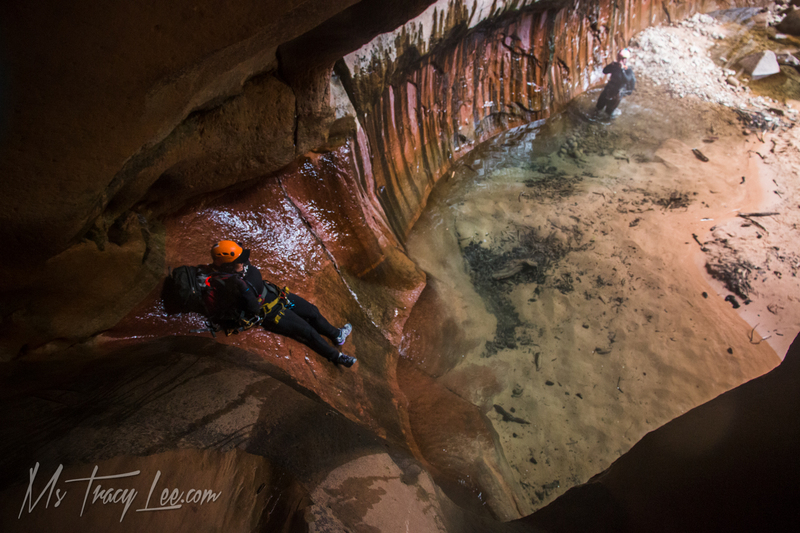 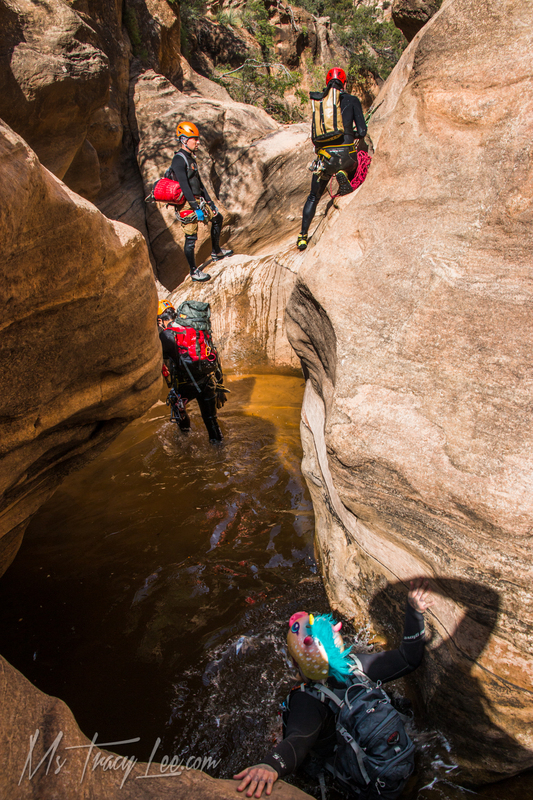 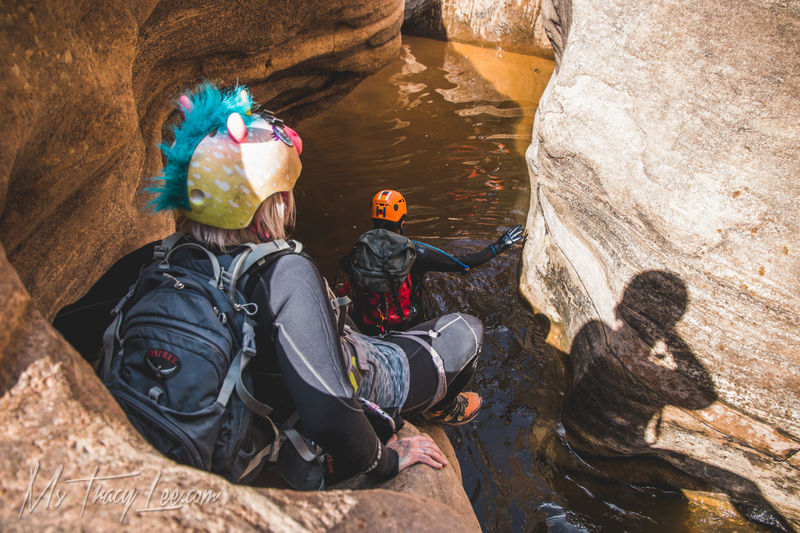 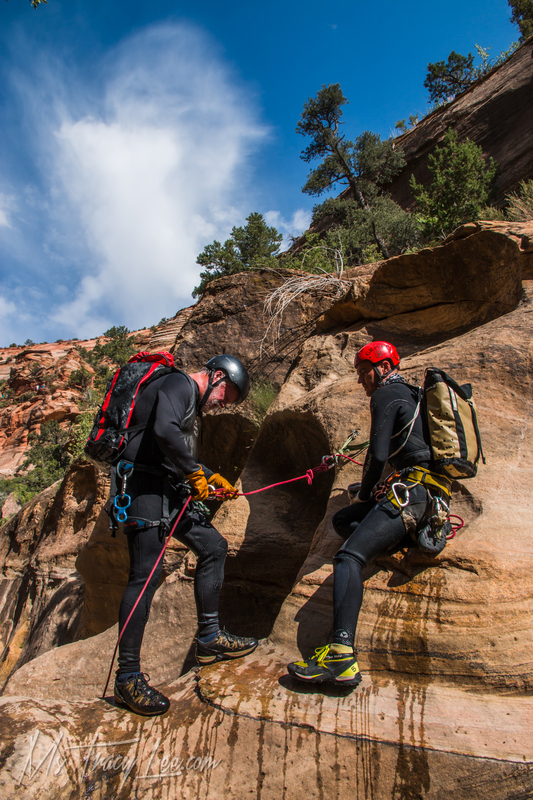 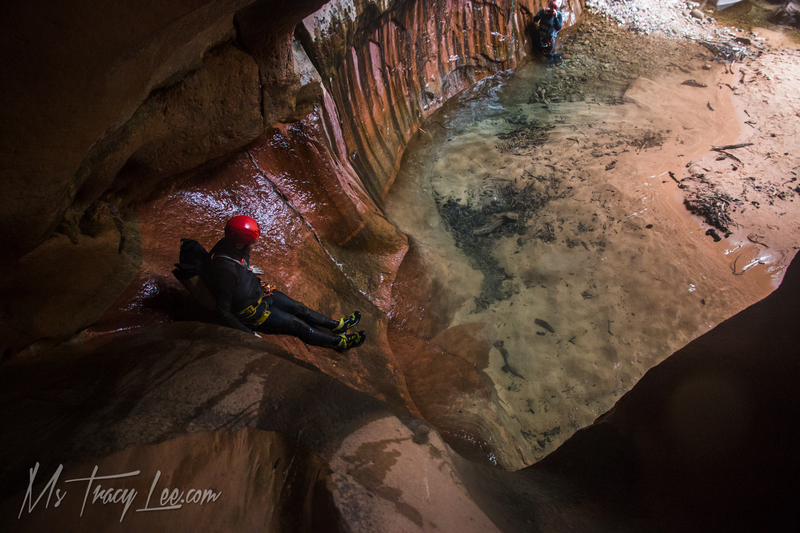 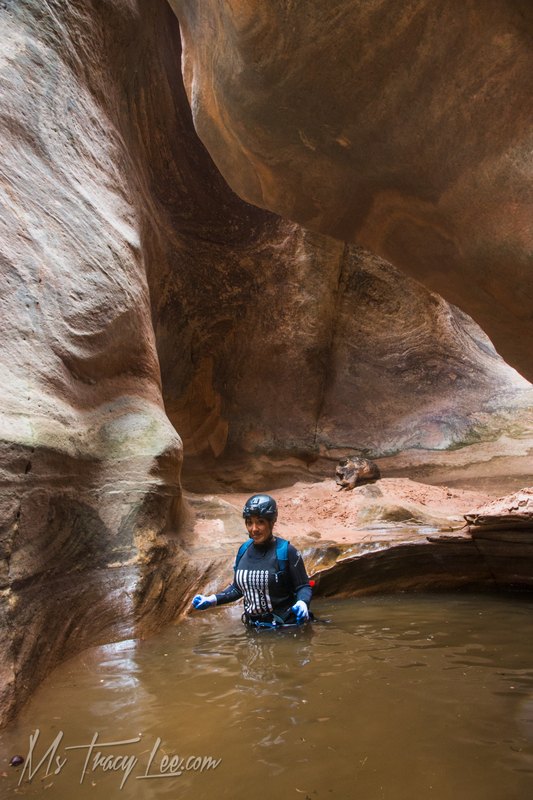 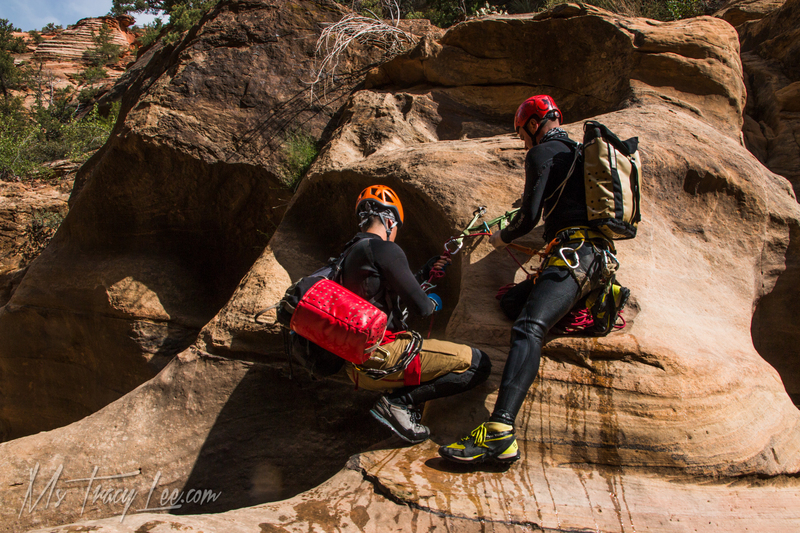 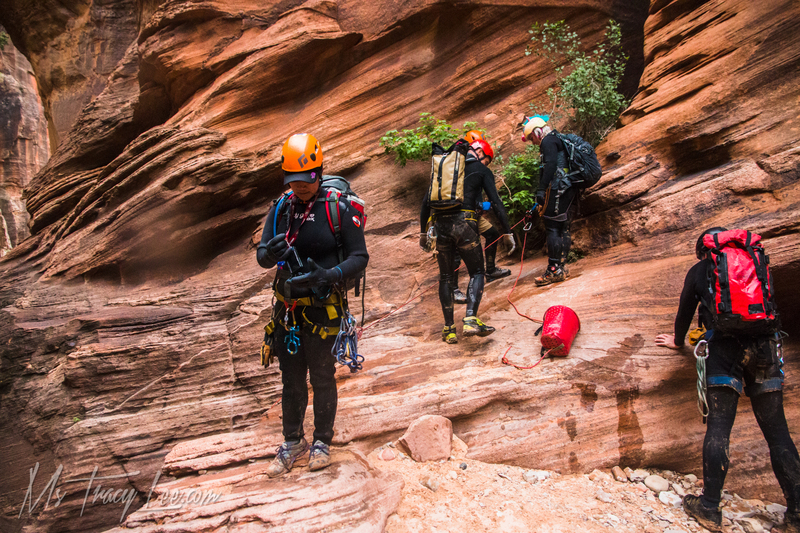 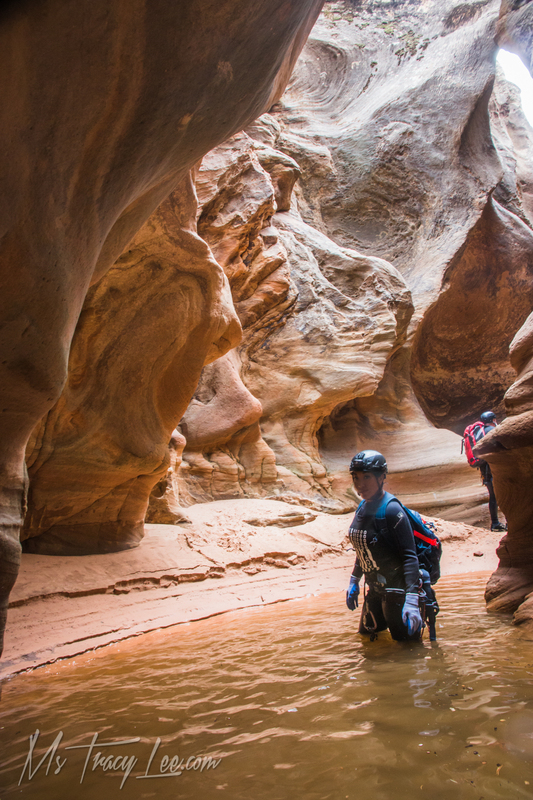 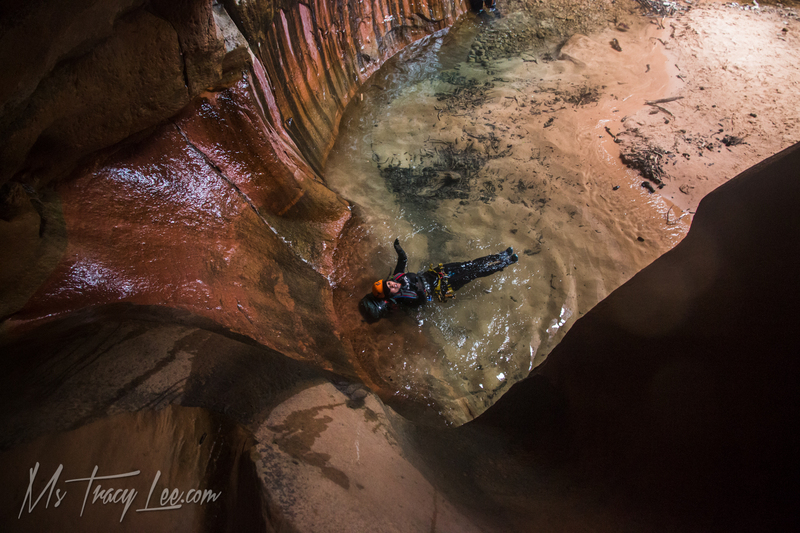 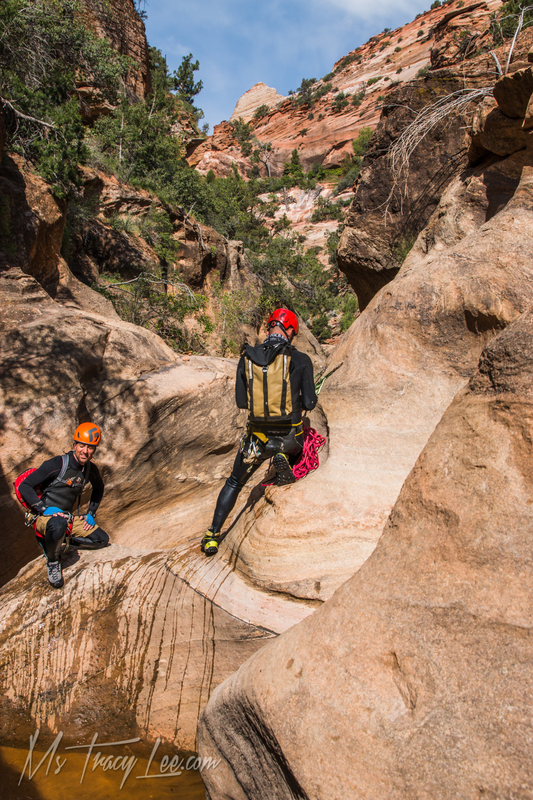 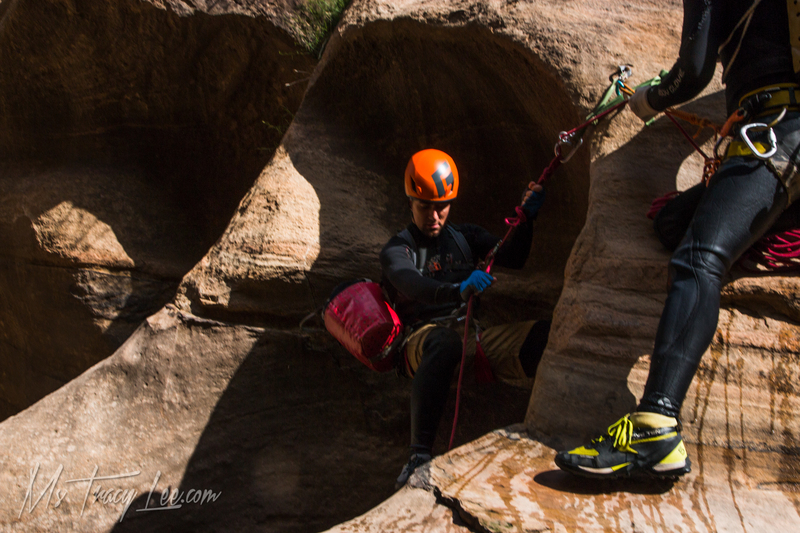 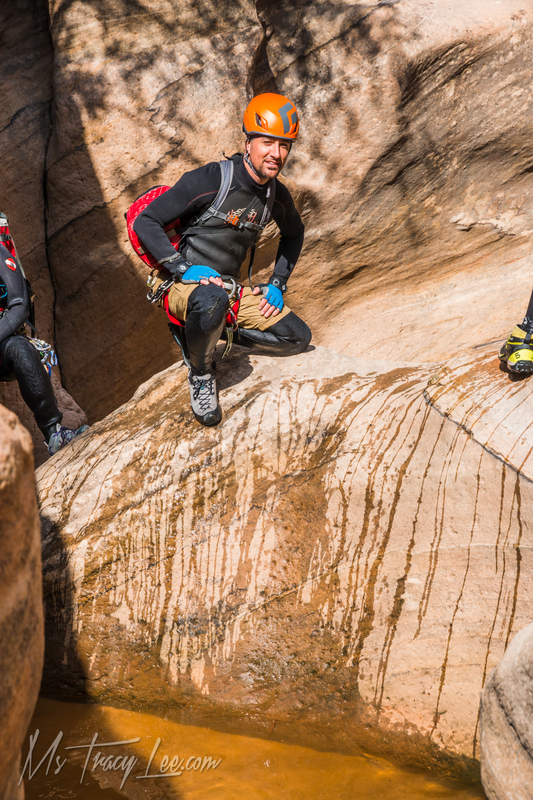 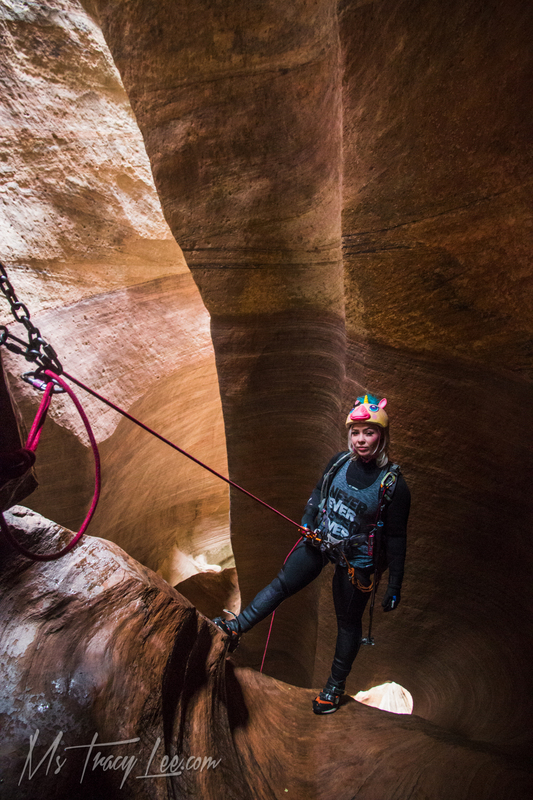 The entrance to the canyon is less than a quarter mile from the parking area so we wouldn't have to suffer in our wetsuits very long. 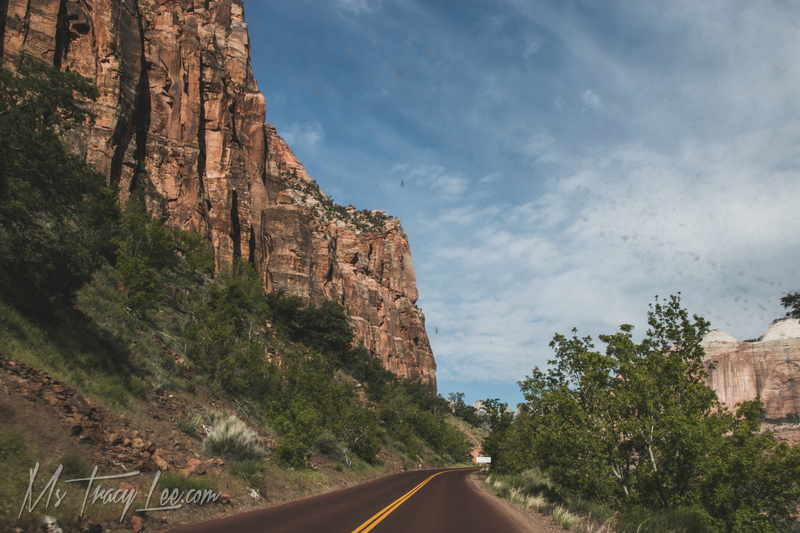 The skies looked very blue, dotted with puffy white clouds. 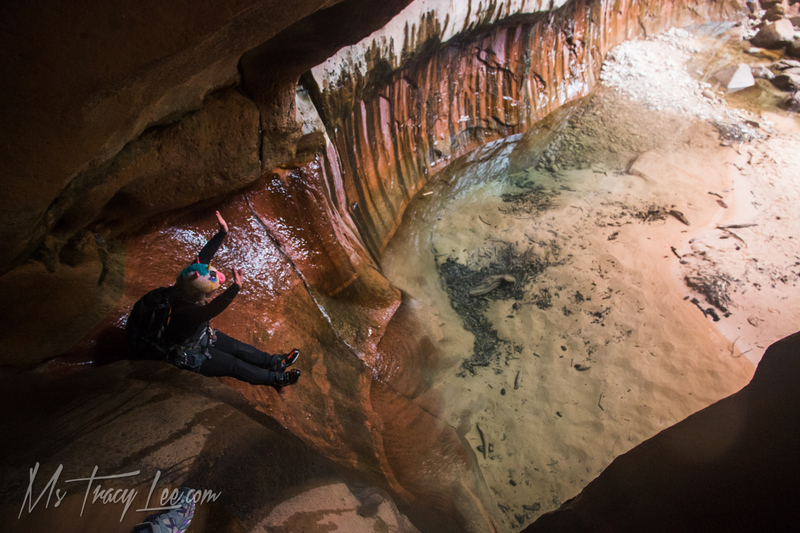 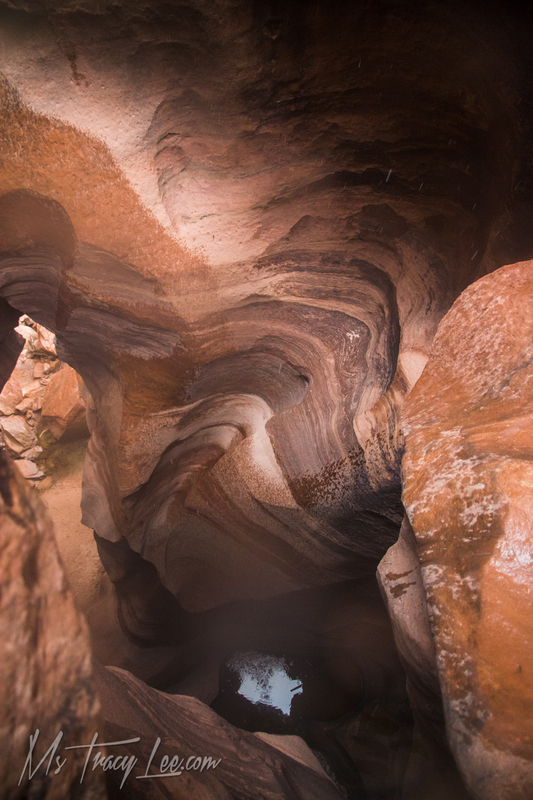 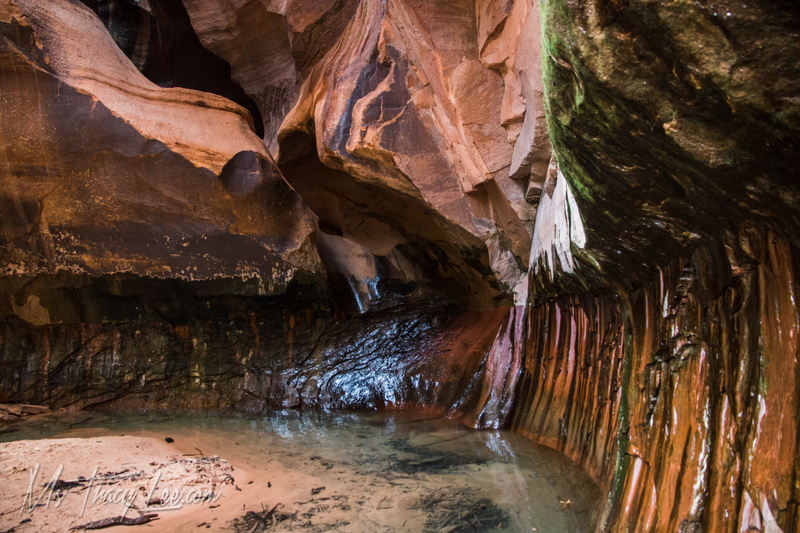 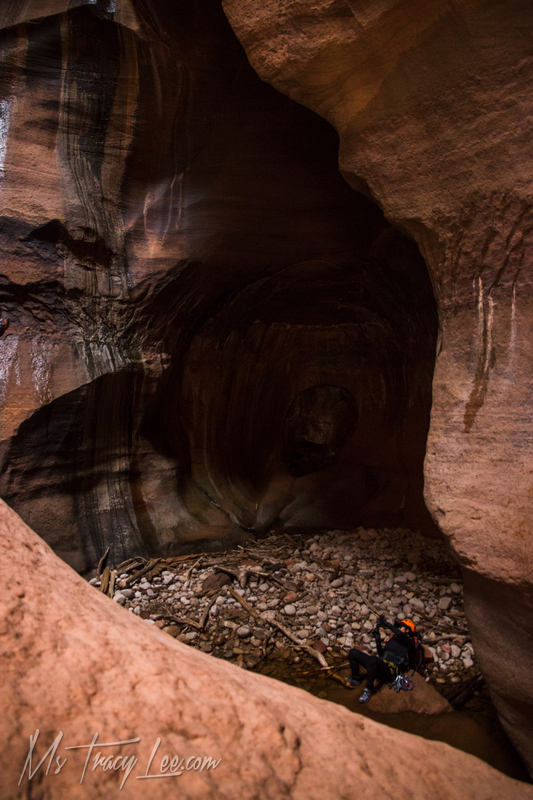 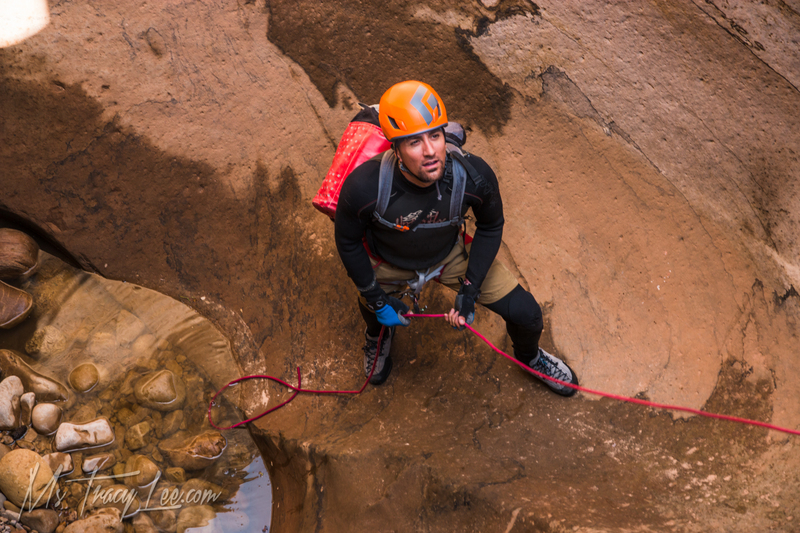 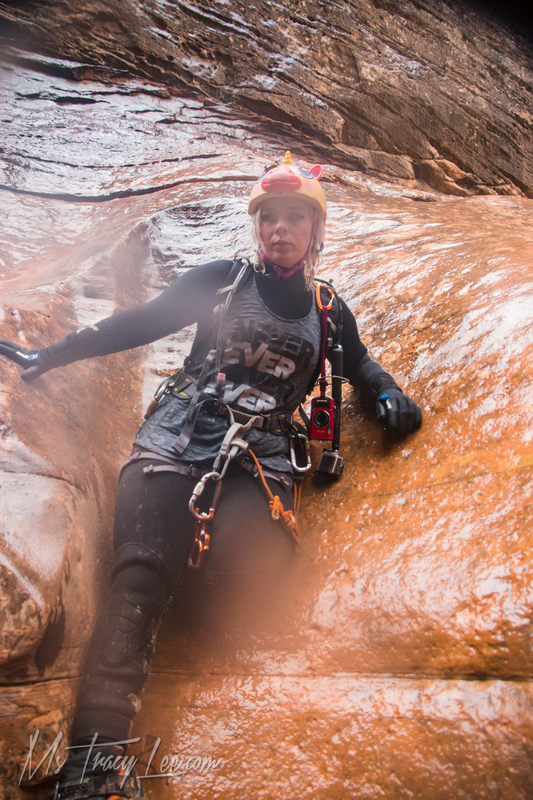 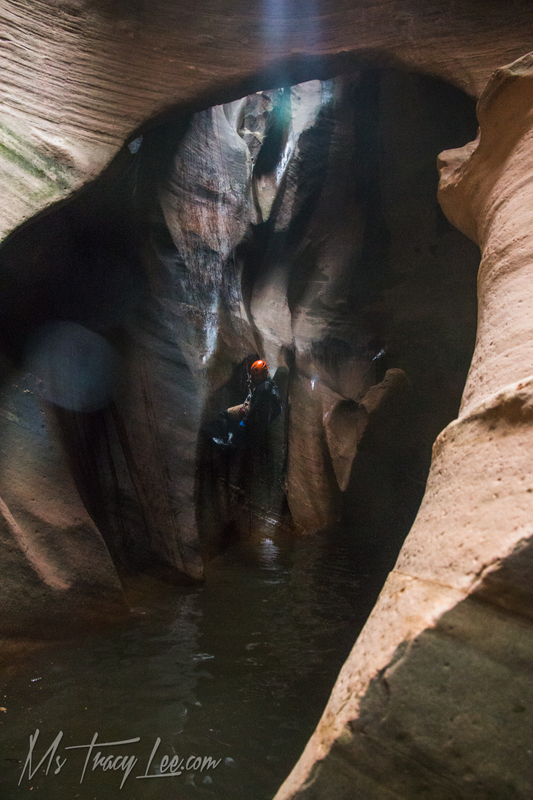 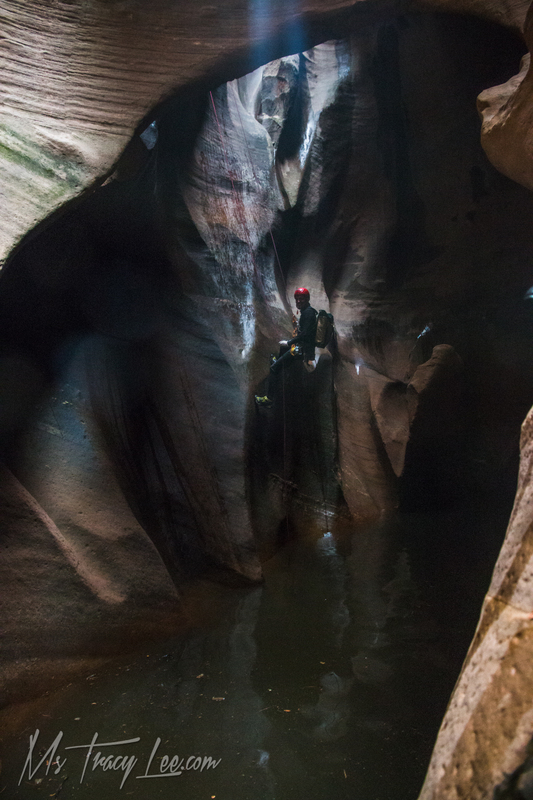 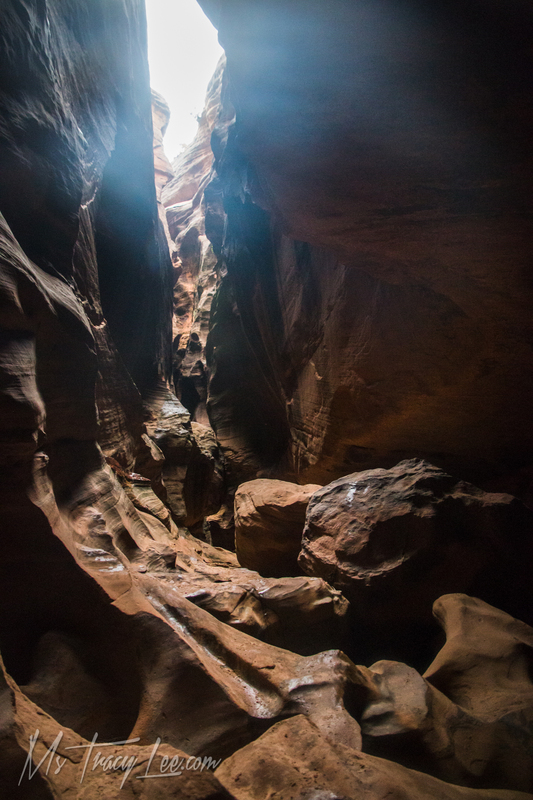 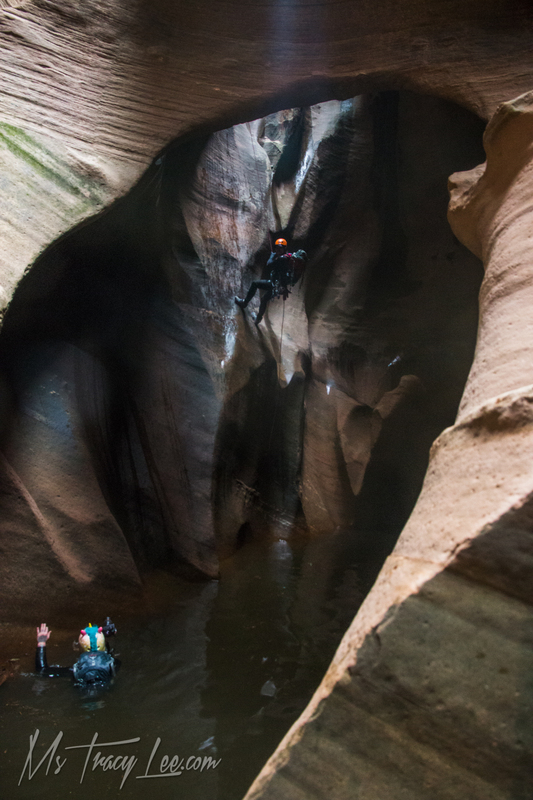 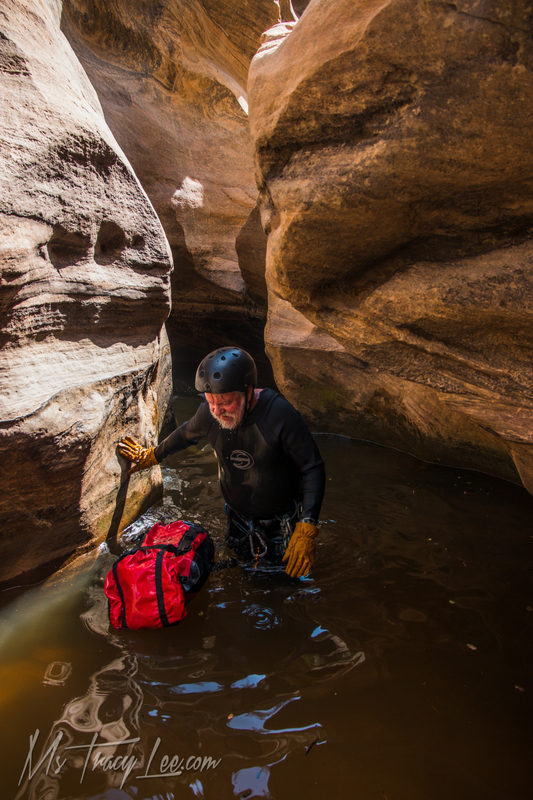 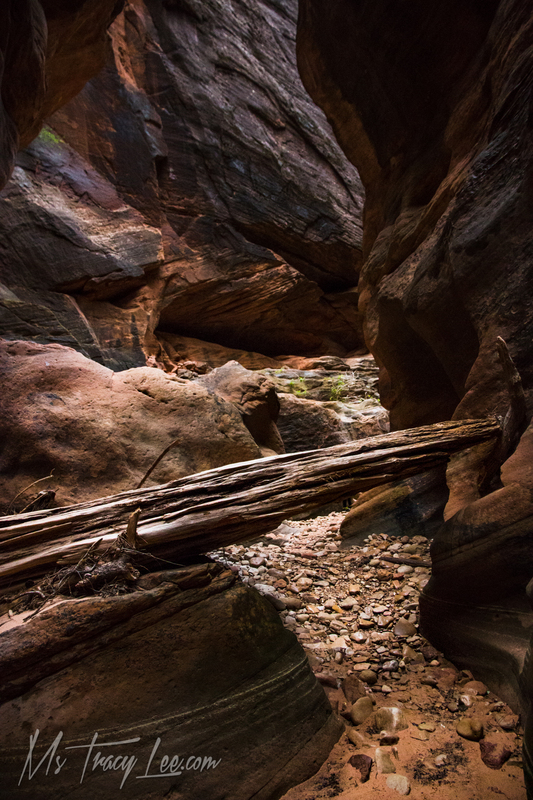 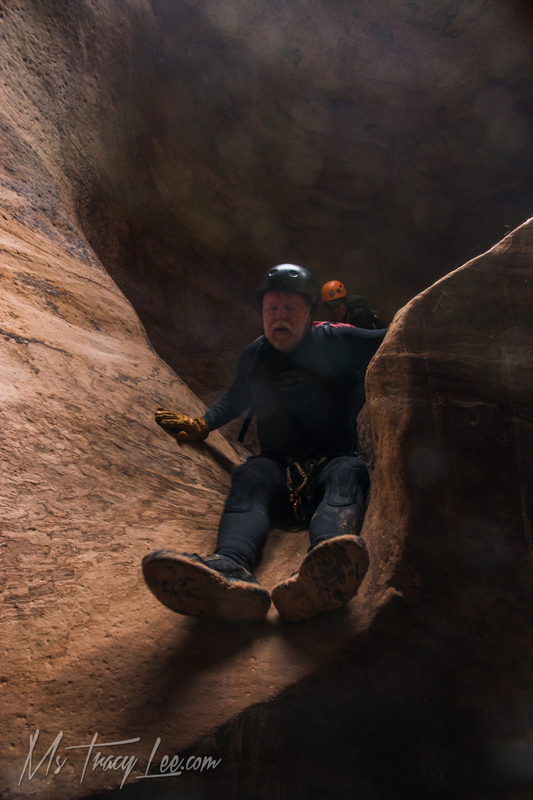 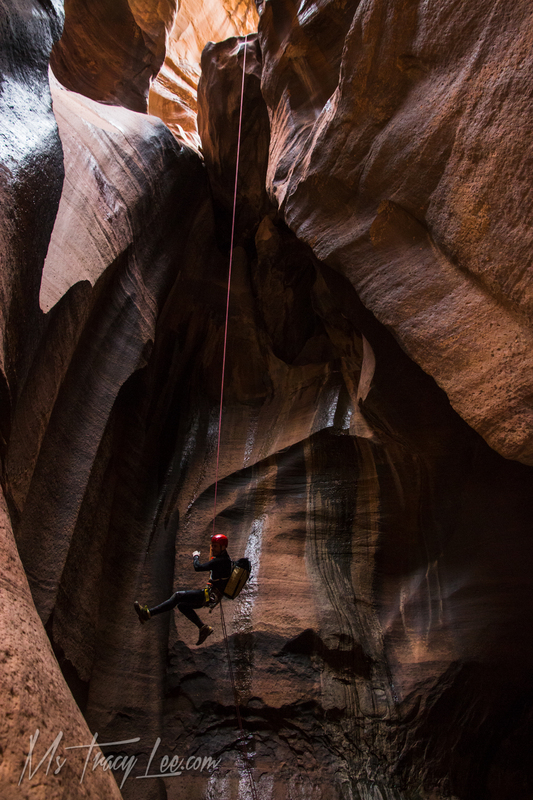 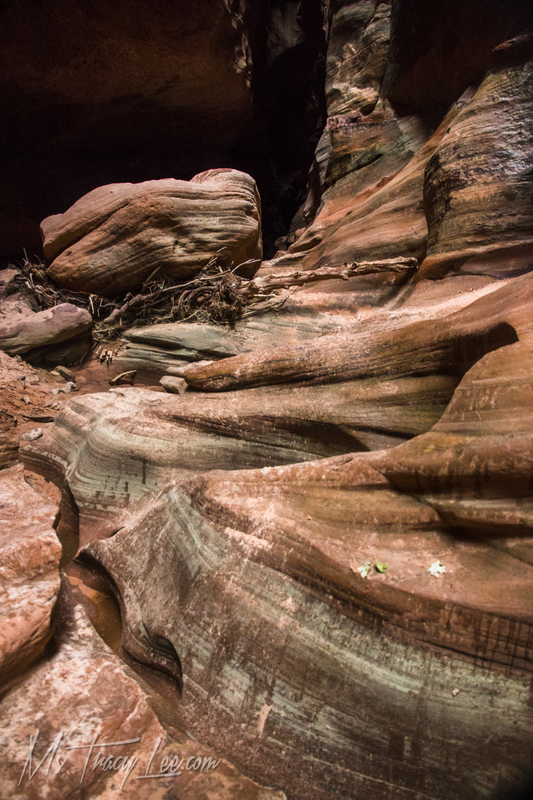 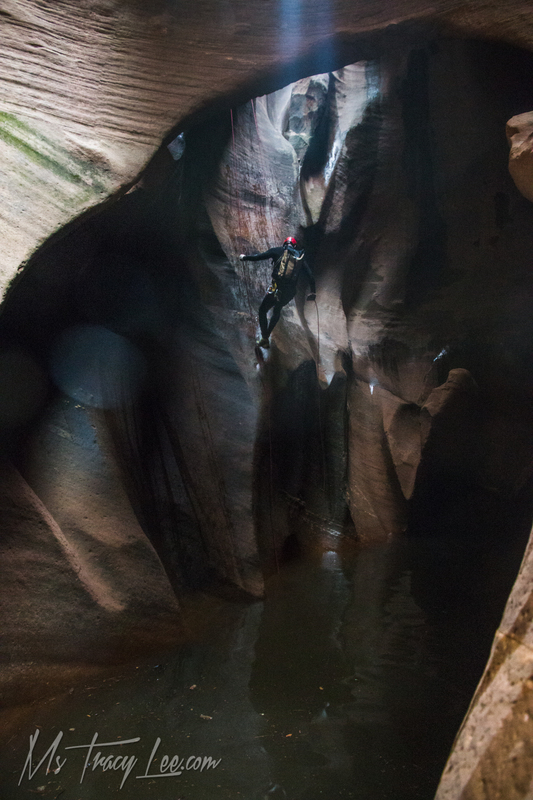 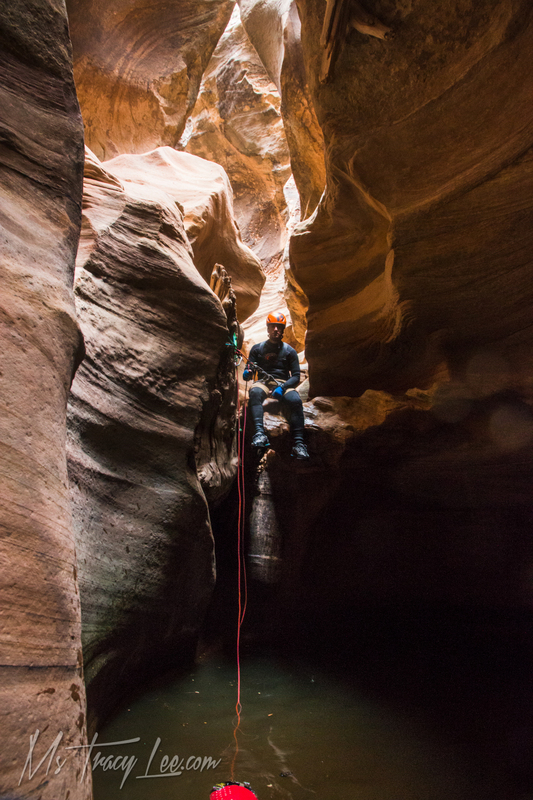 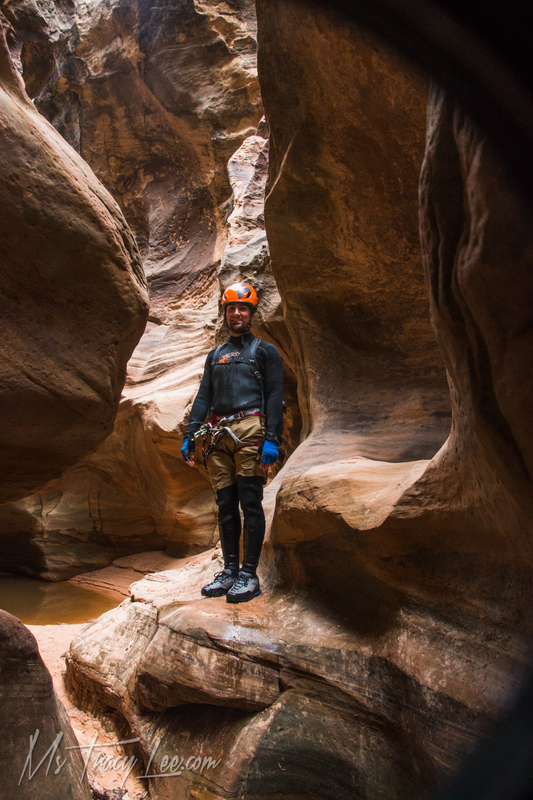 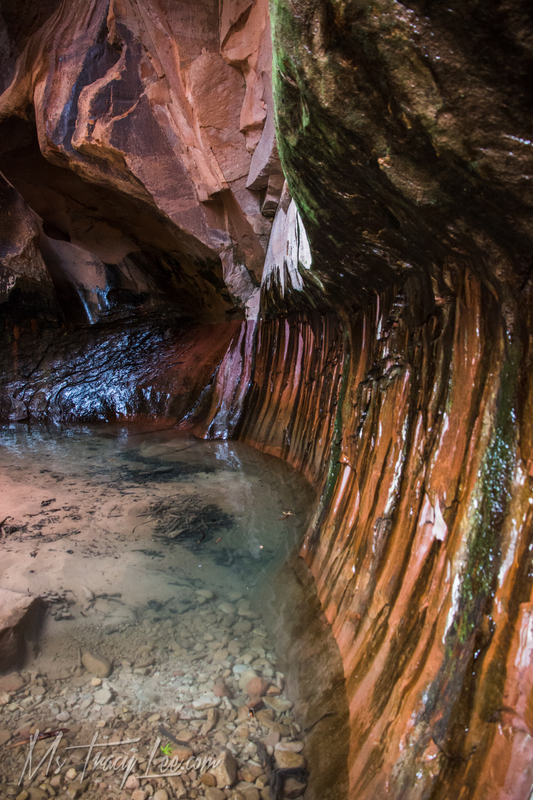 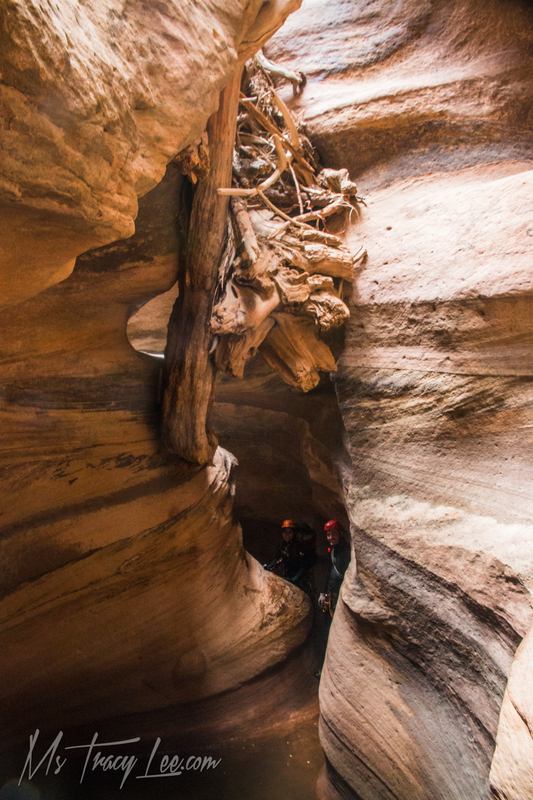 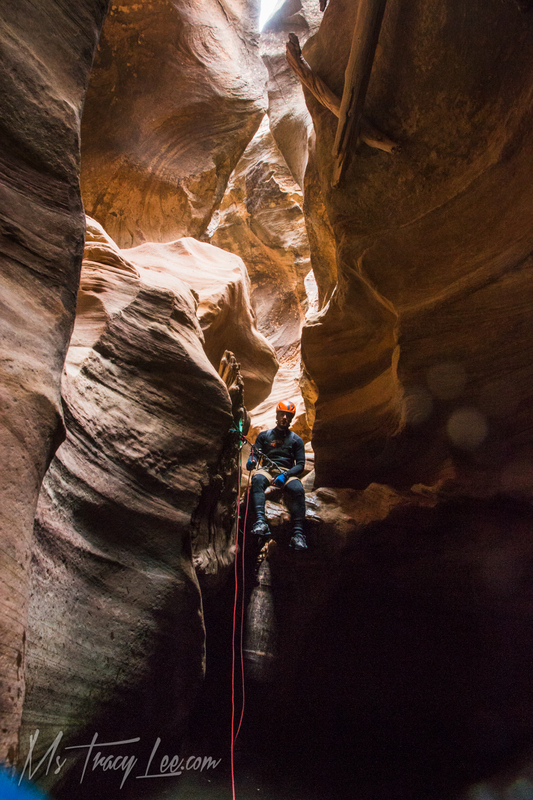 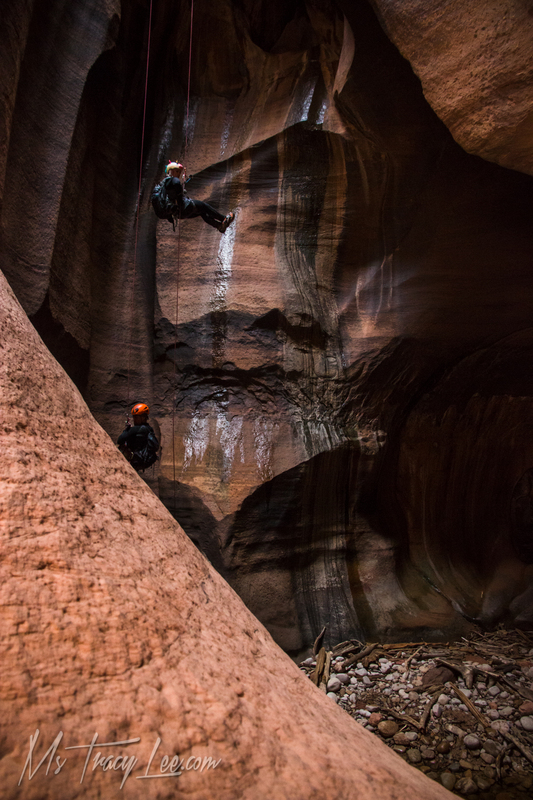 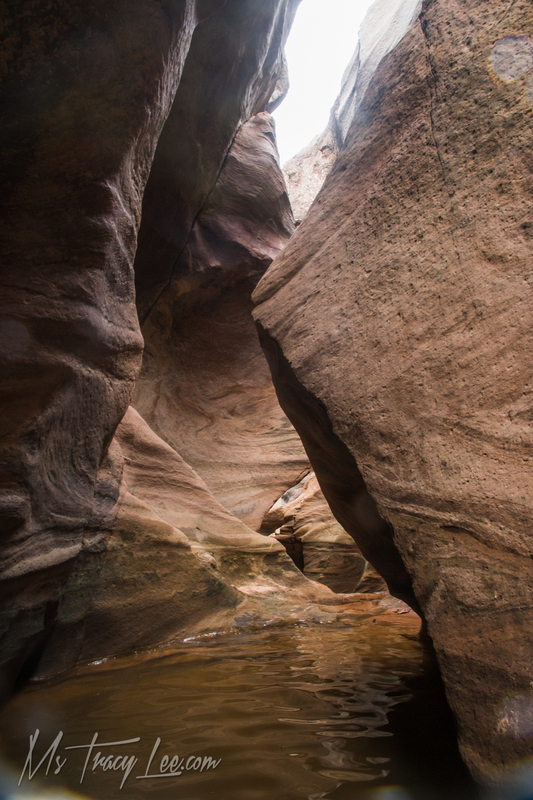 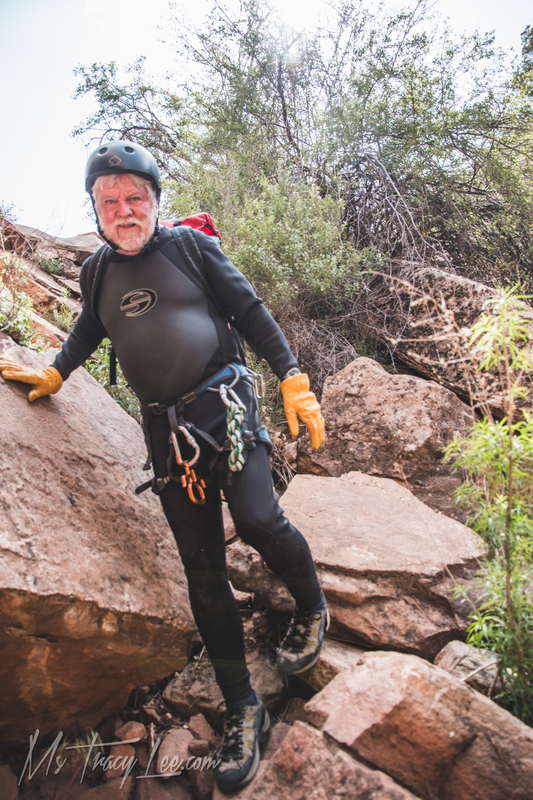 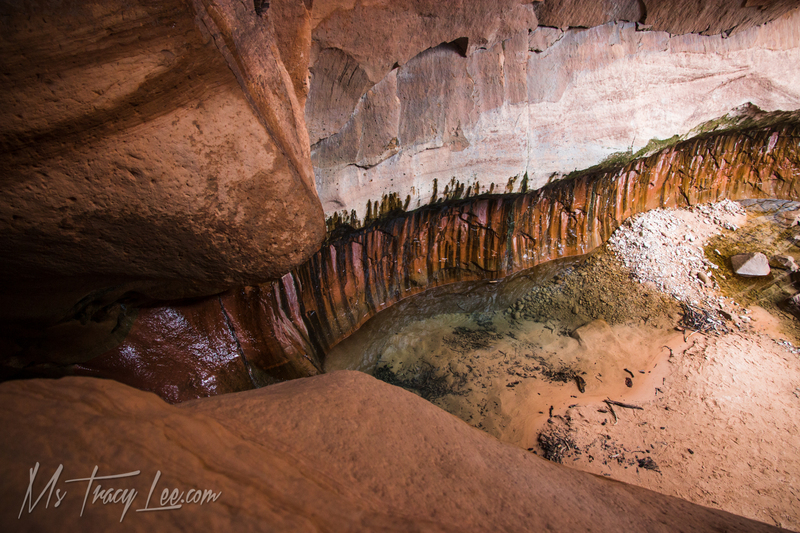 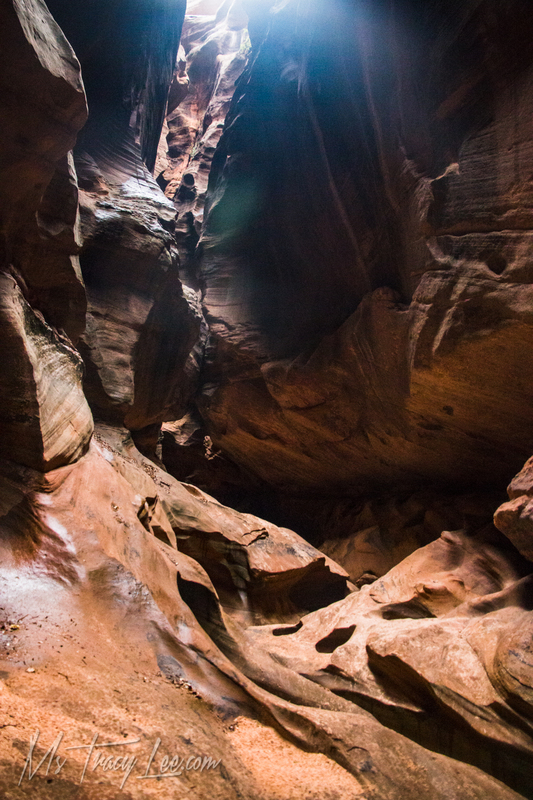 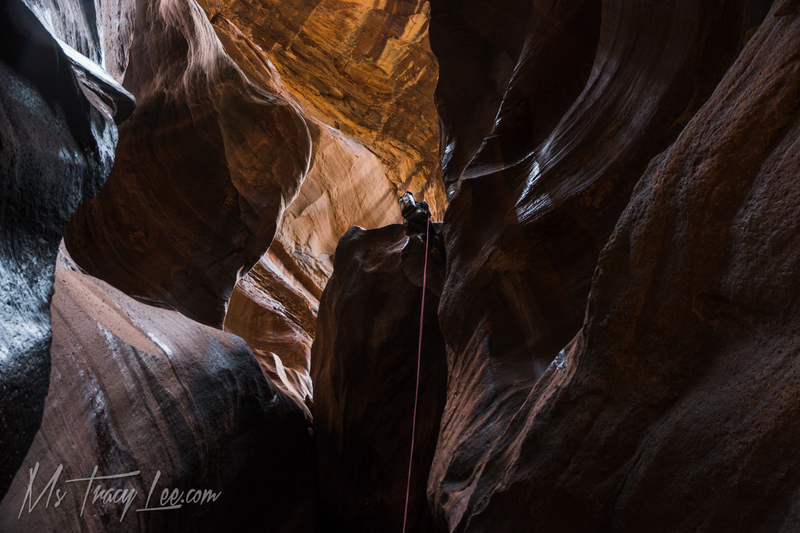 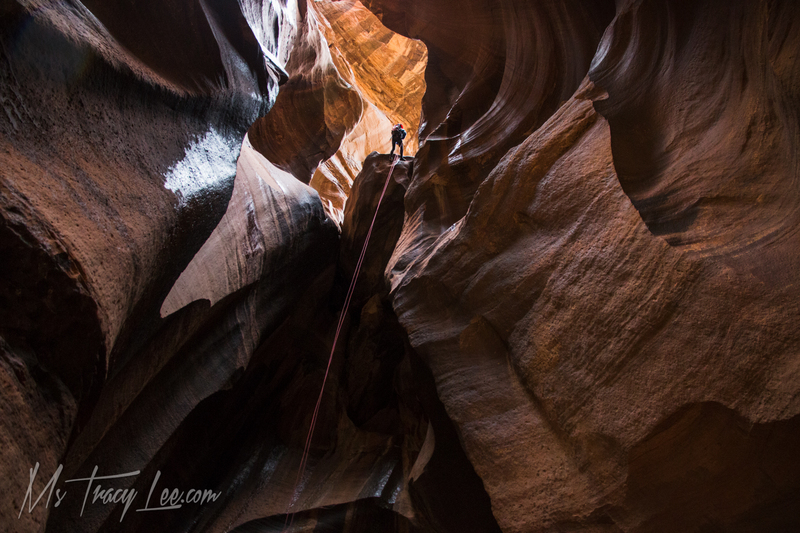 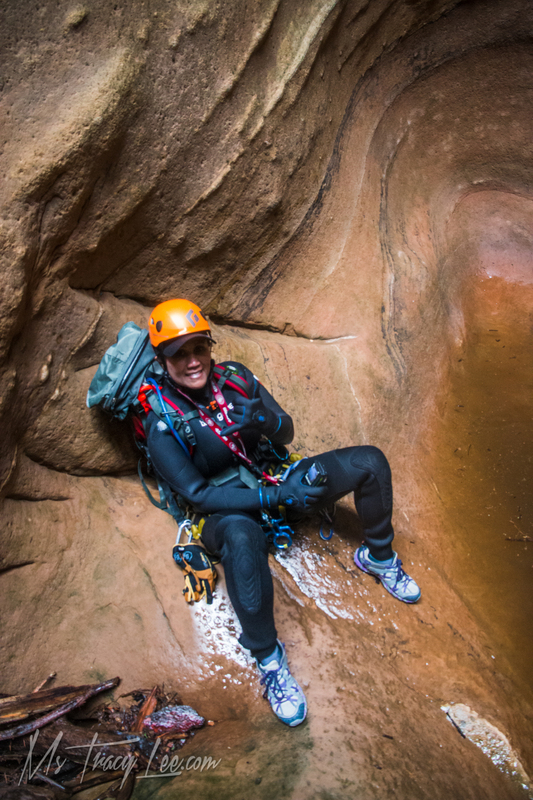 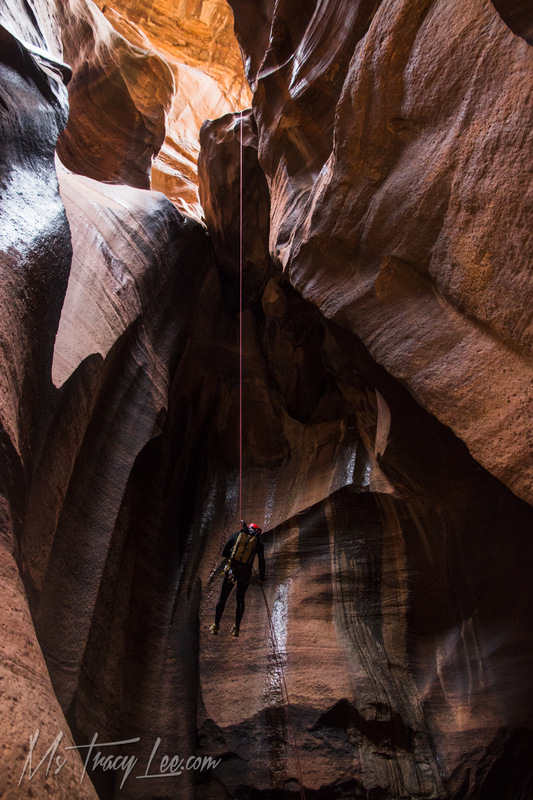 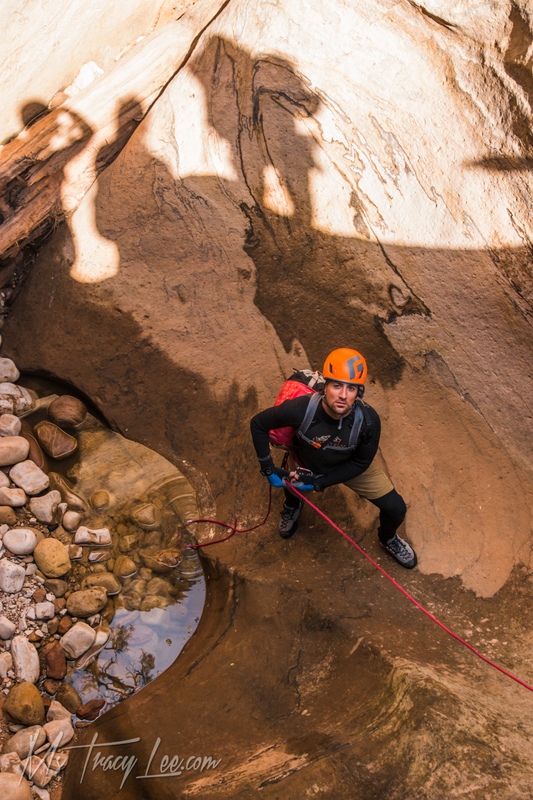 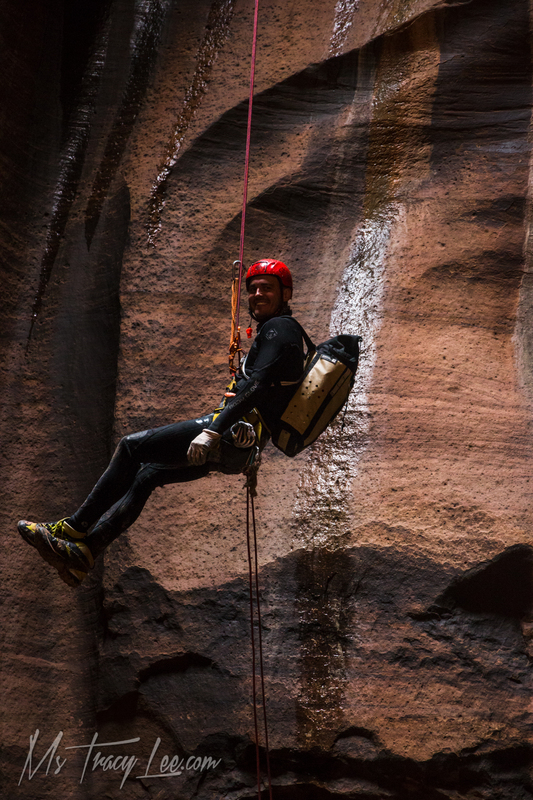 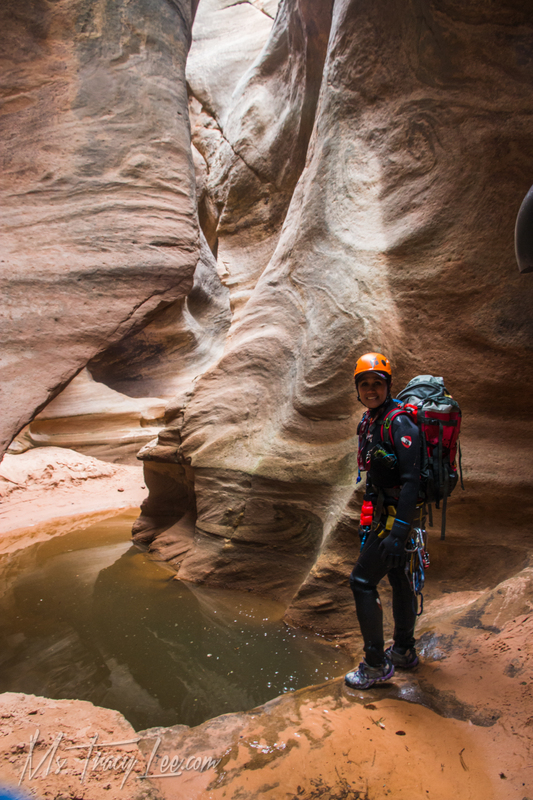 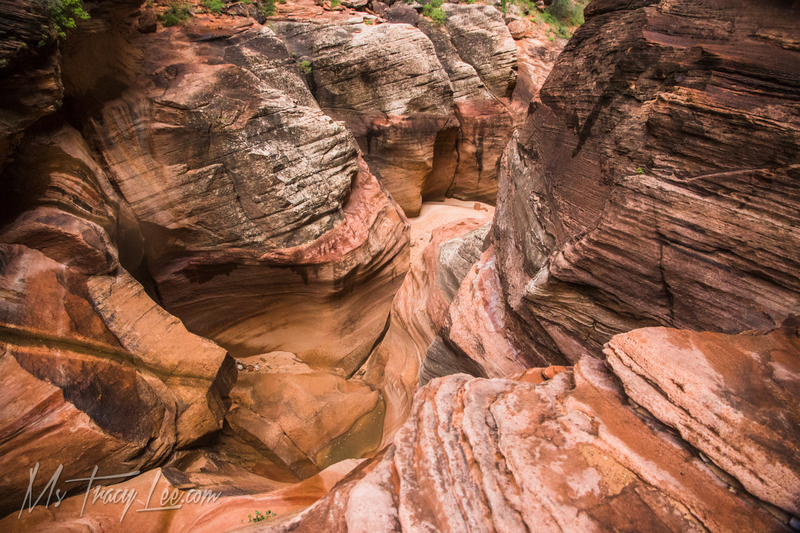 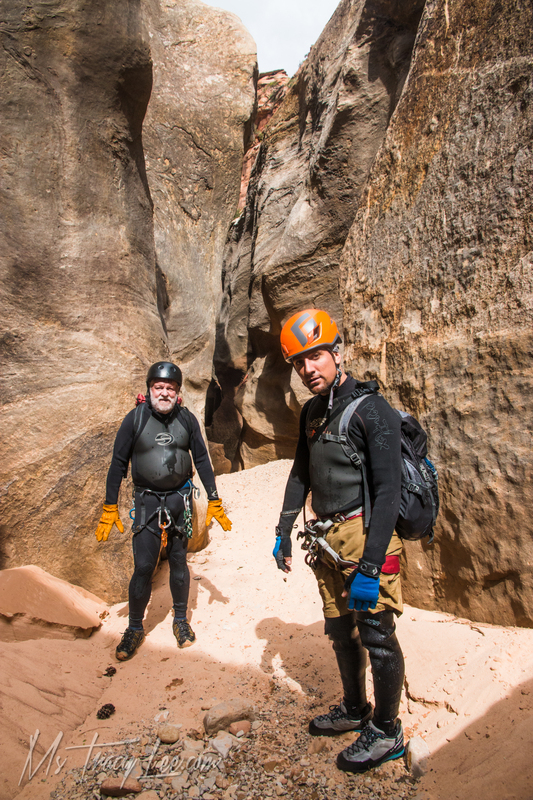 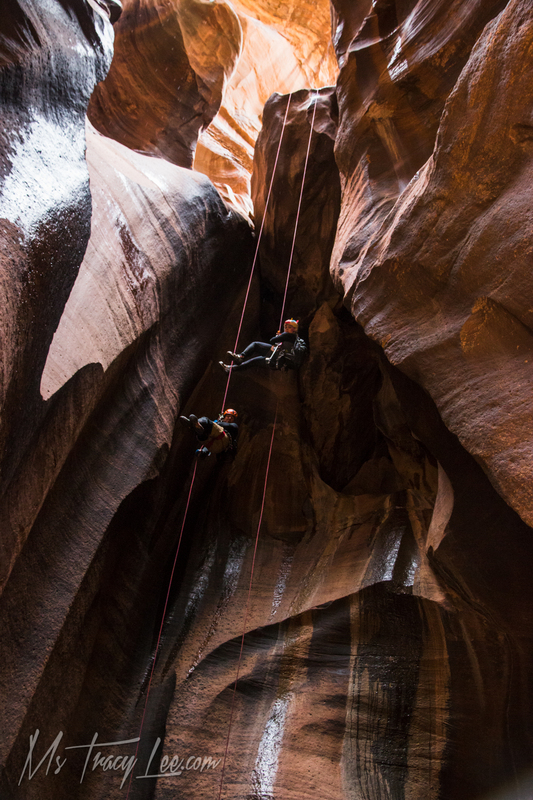 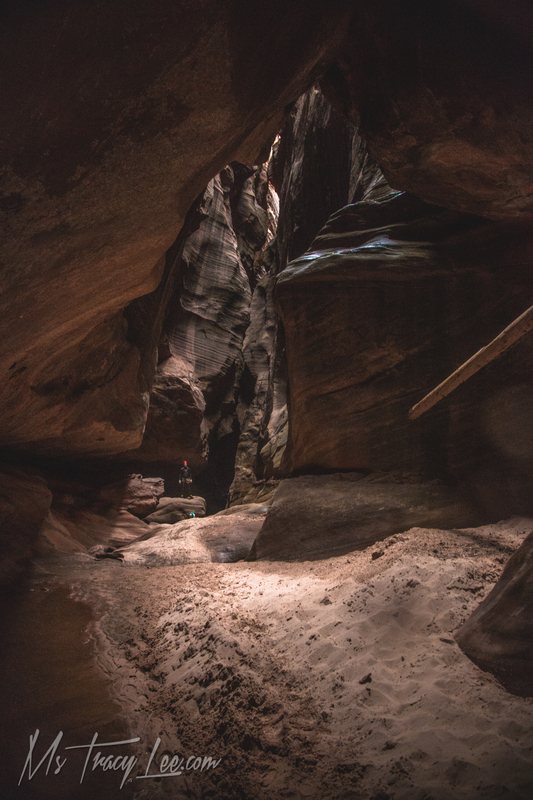 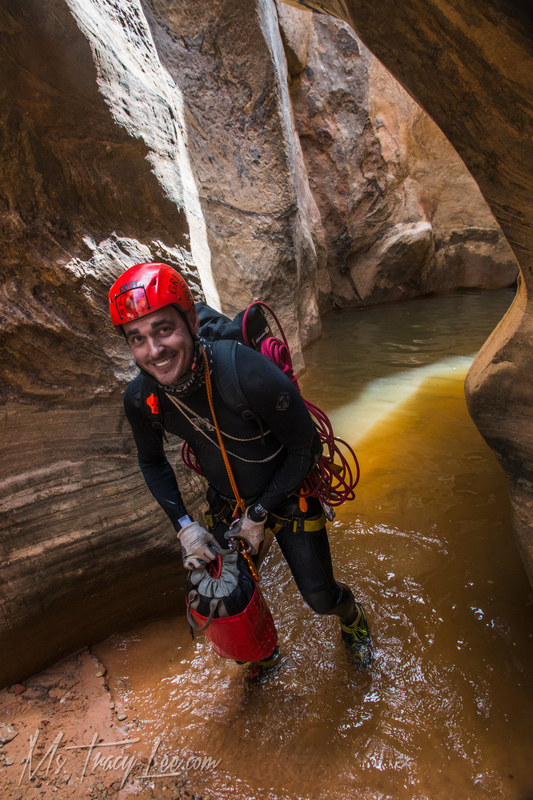 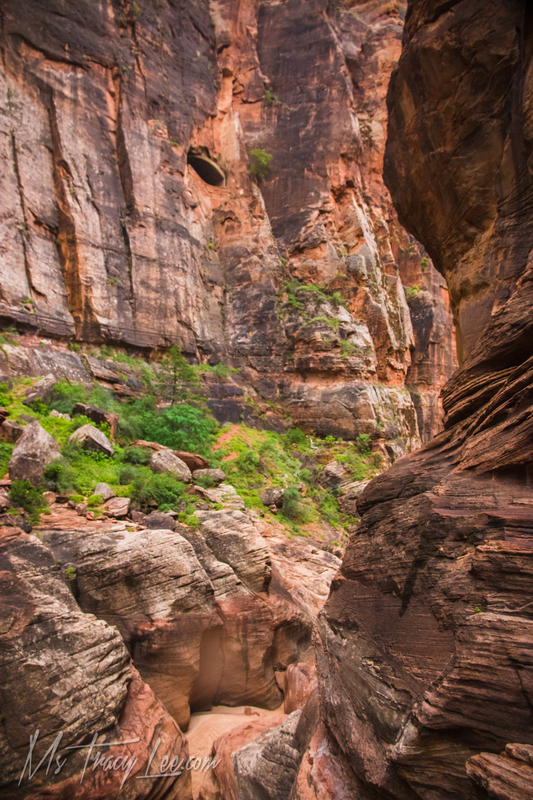 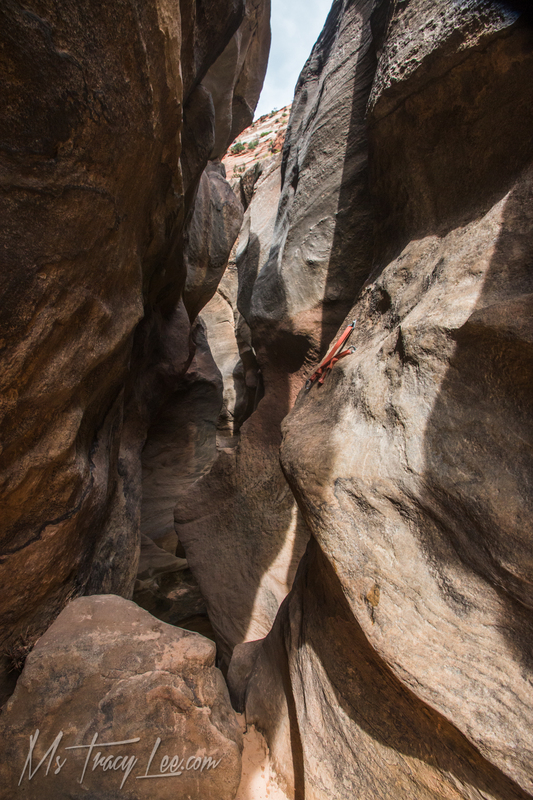 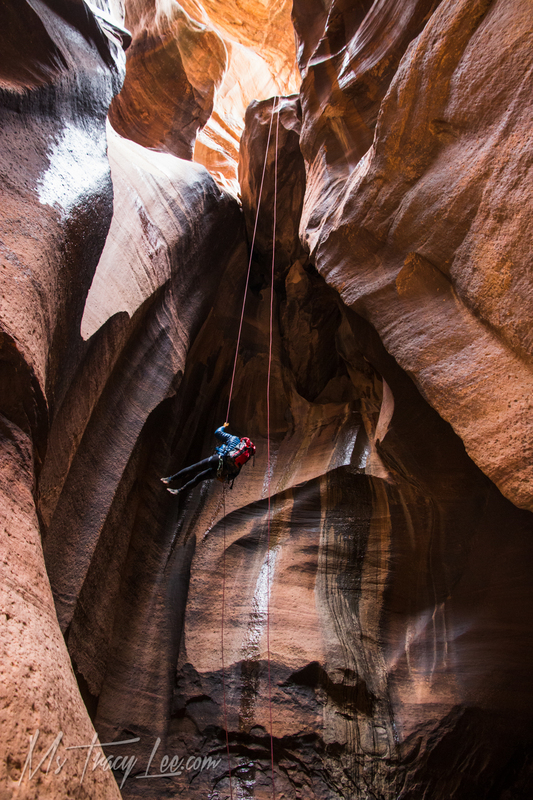 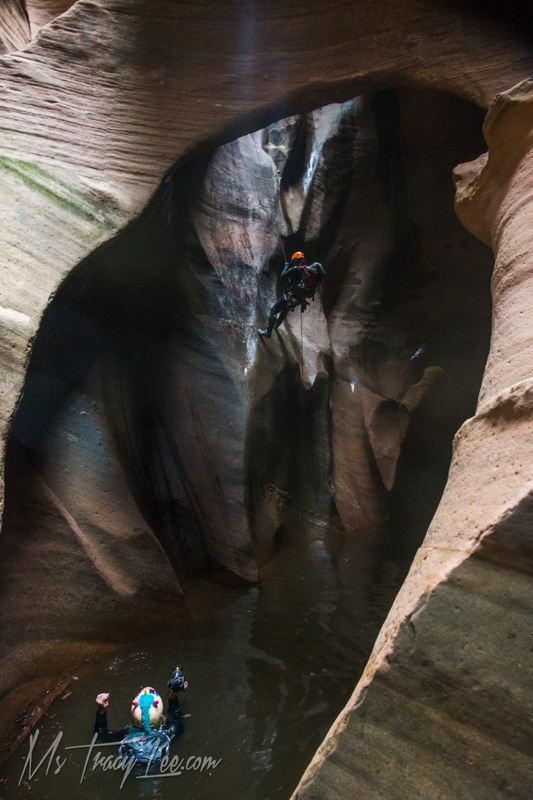 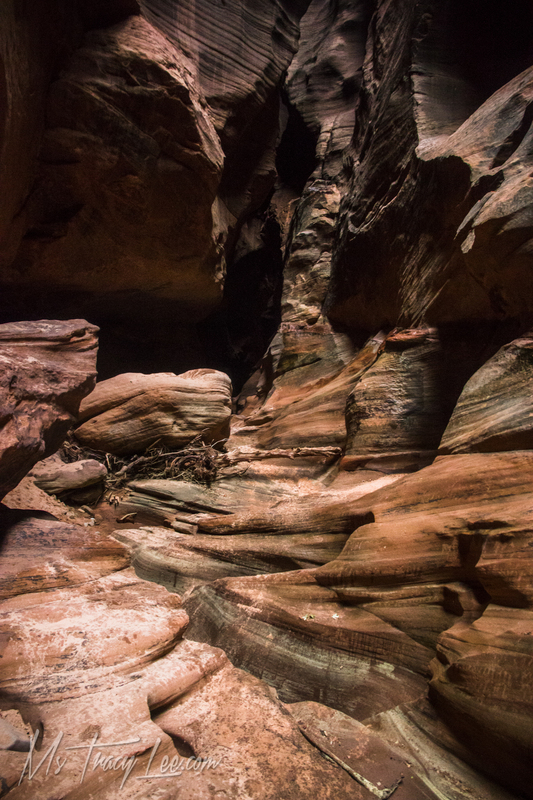 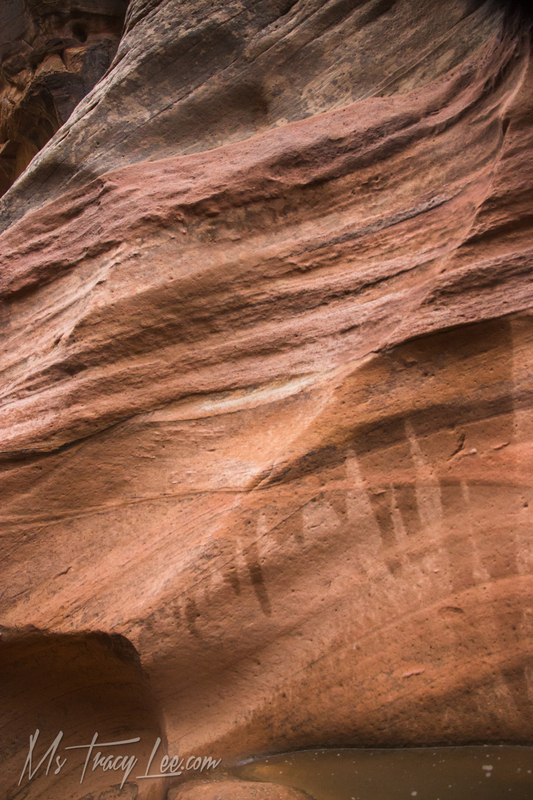 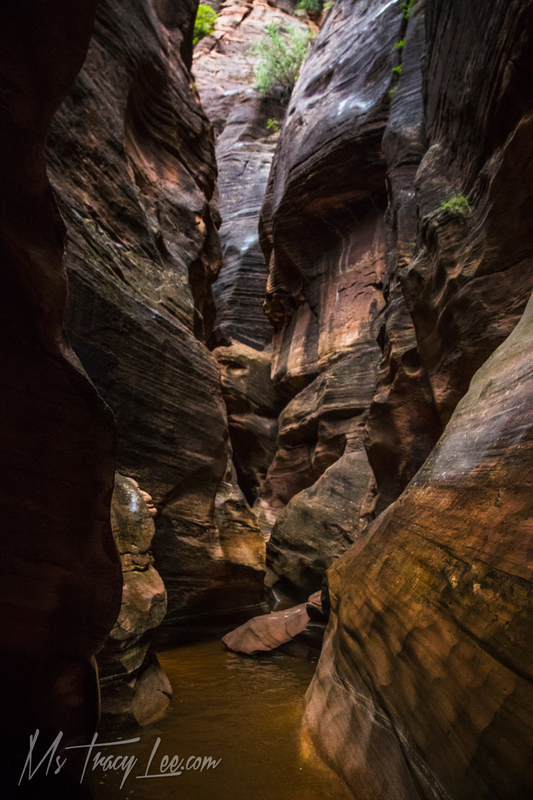 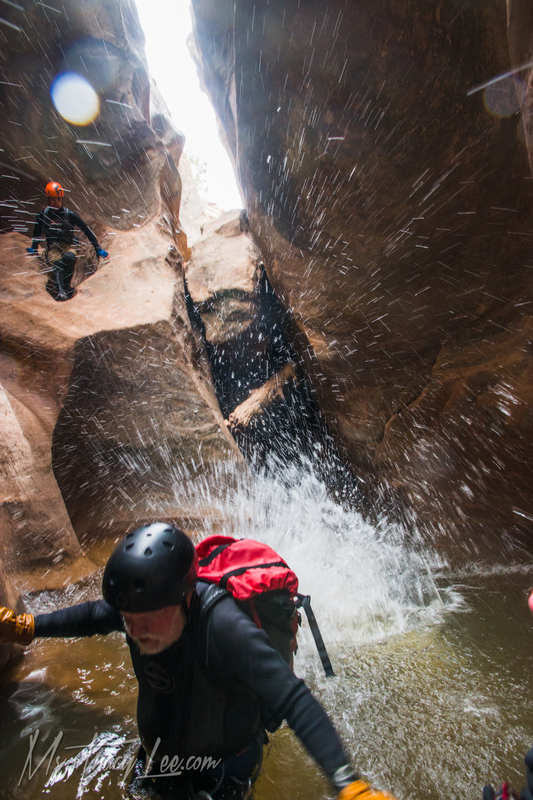 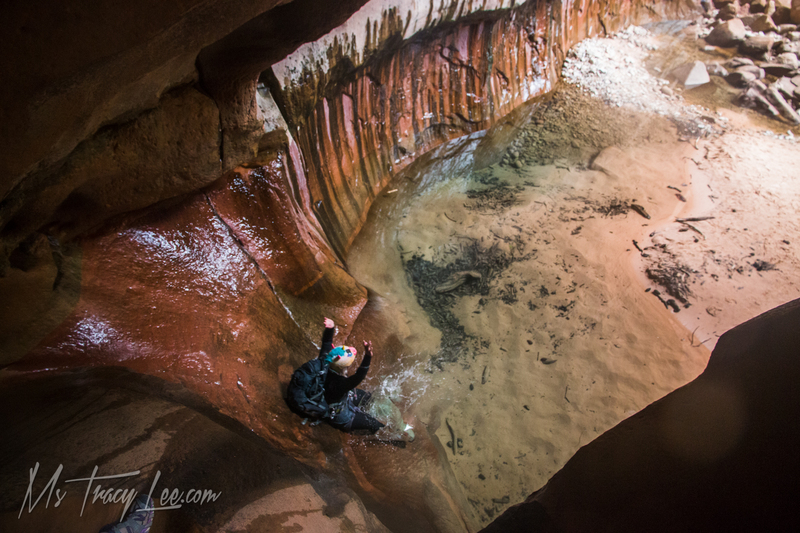 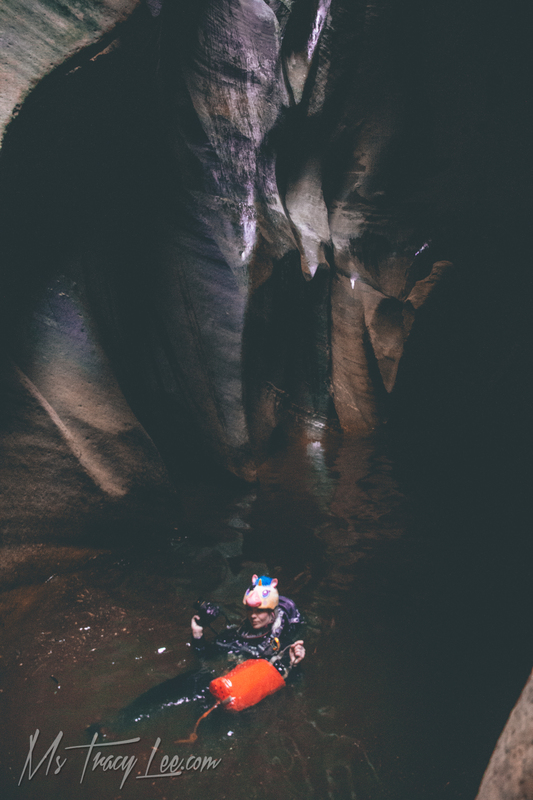 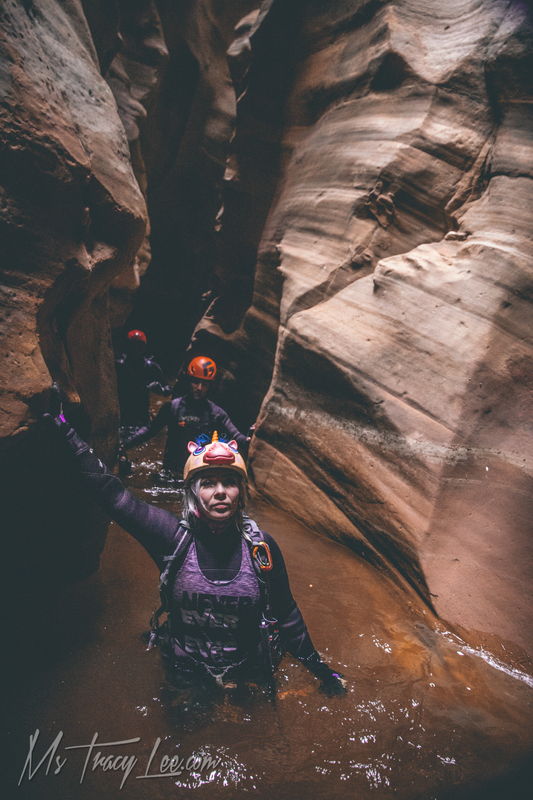 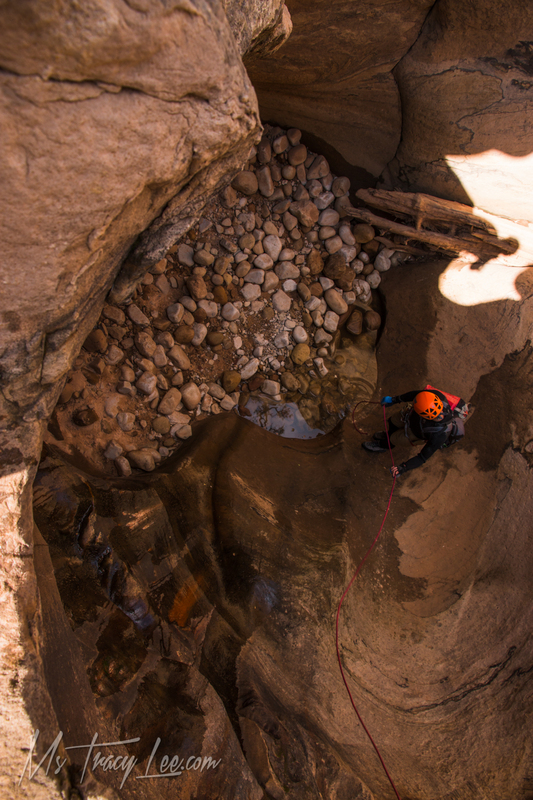 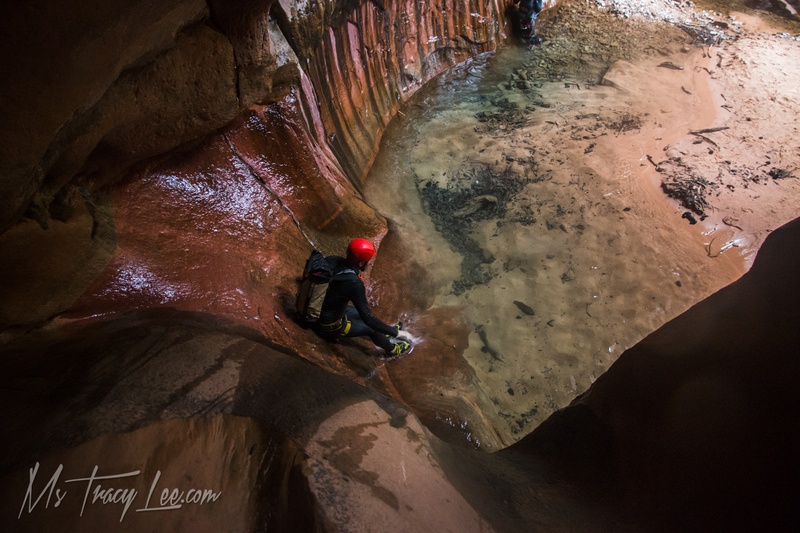 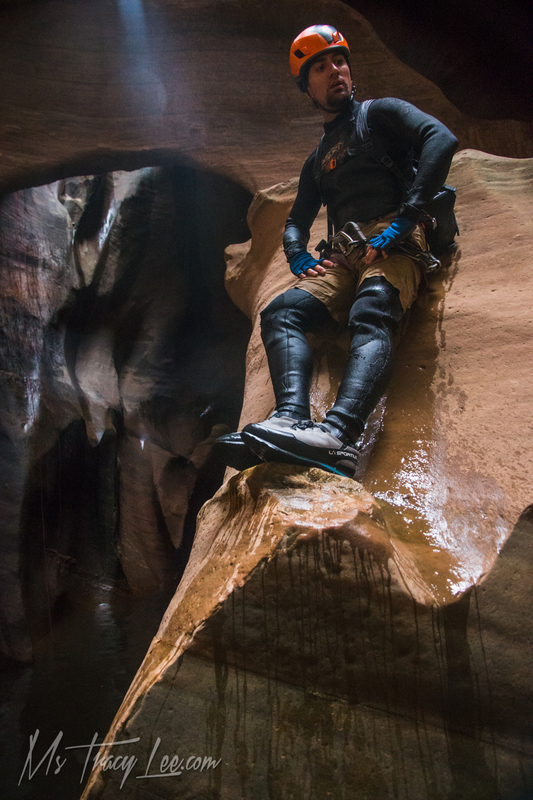 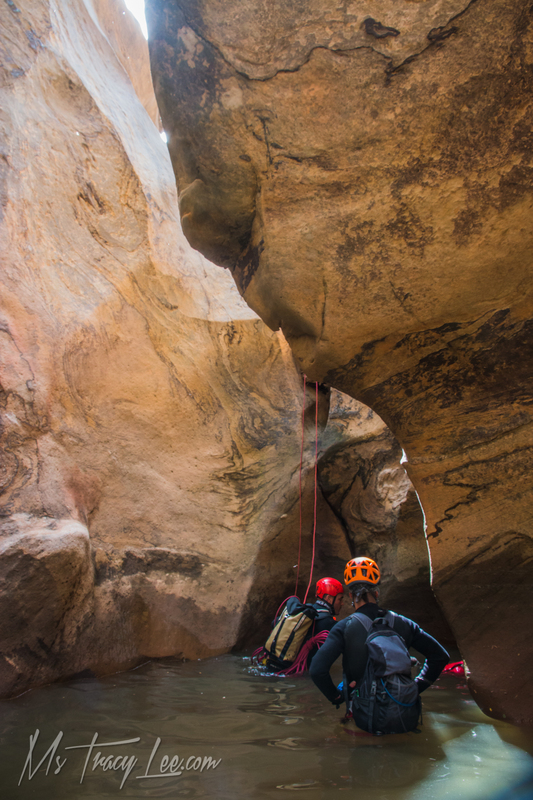 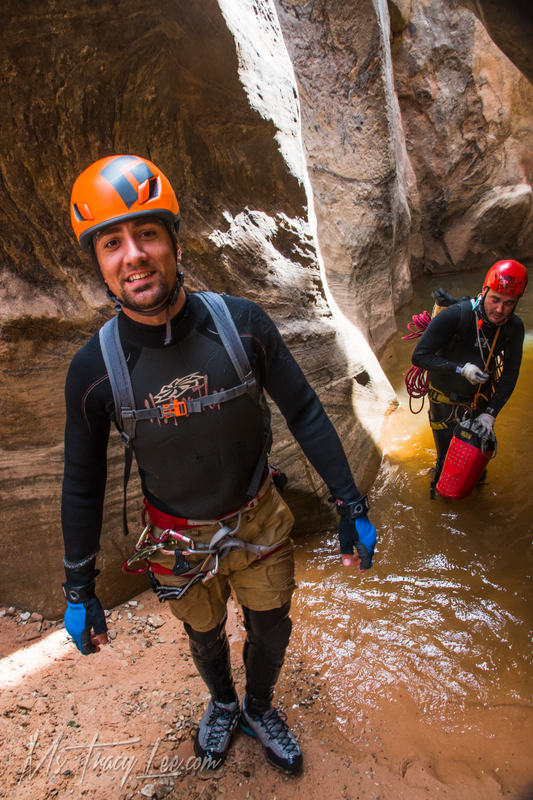 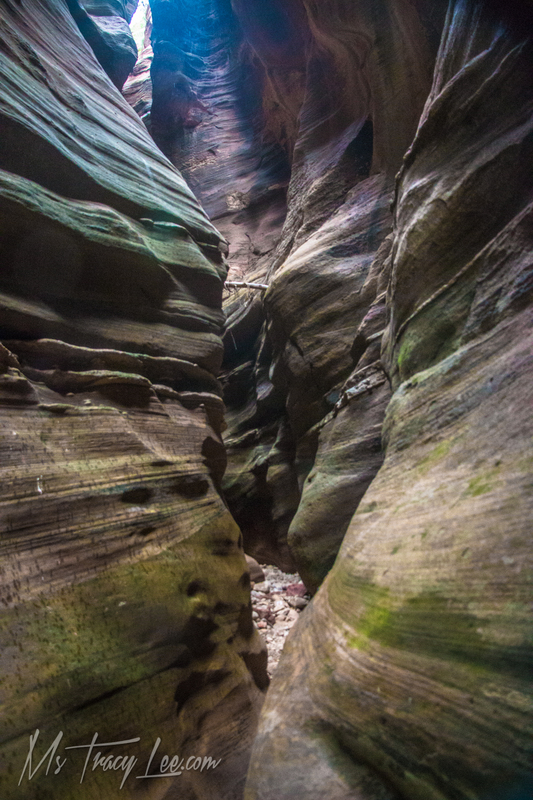 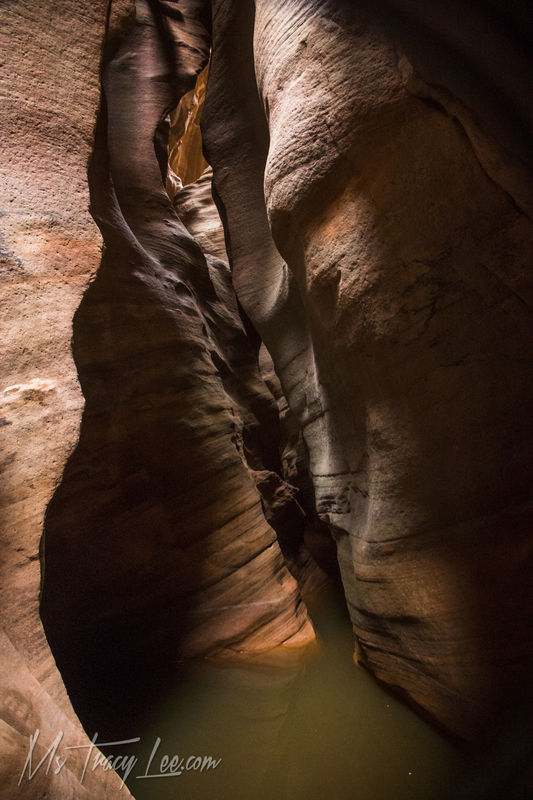 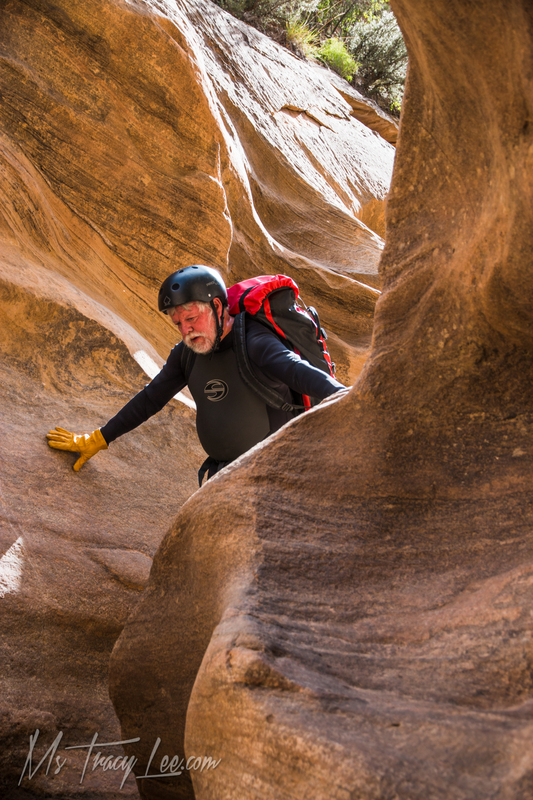 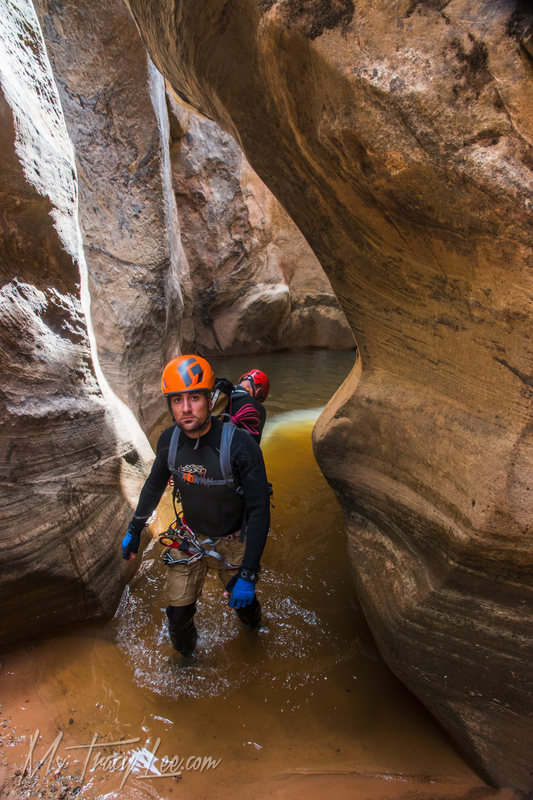 I was super excited to see Pine Creek; it's known as one of the most beautiful and picturesque slot canyons around. 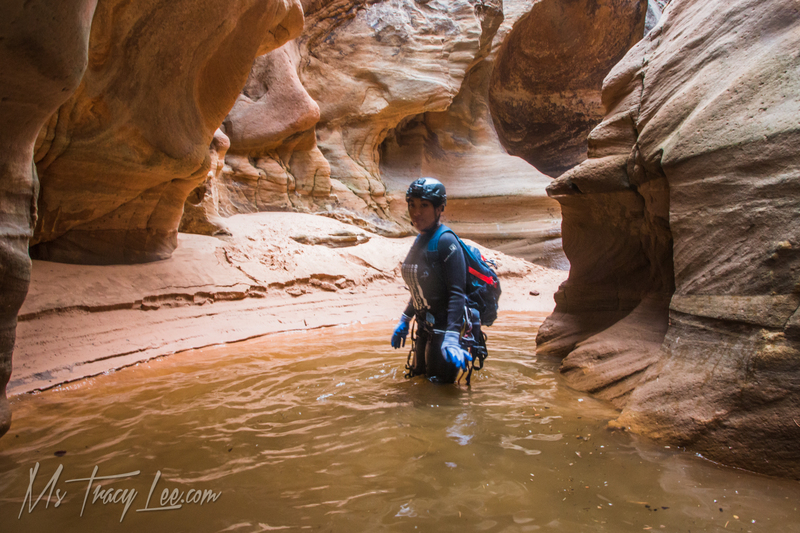 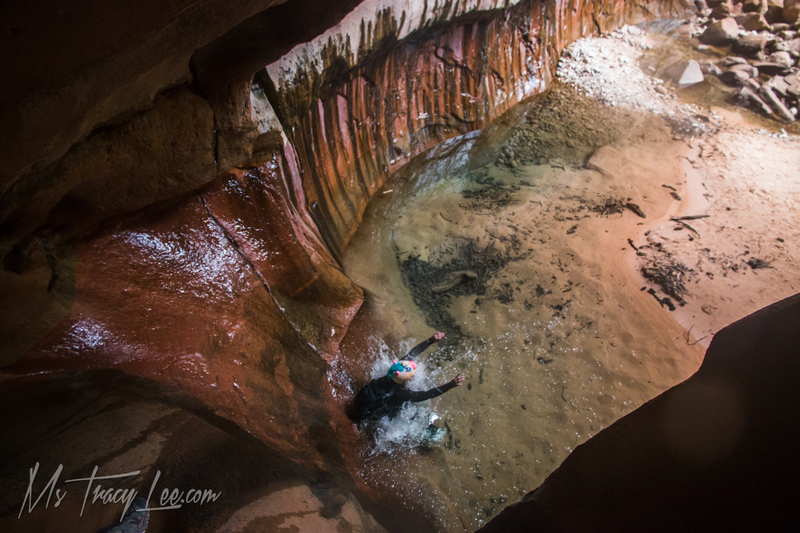 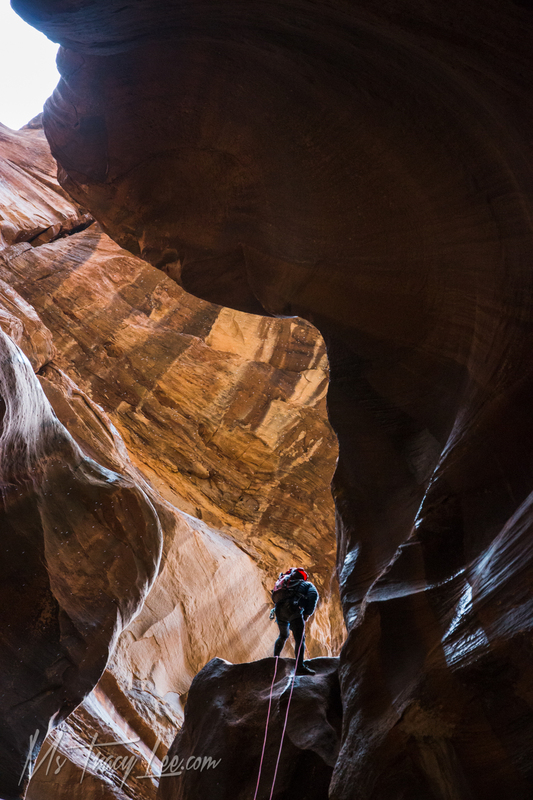 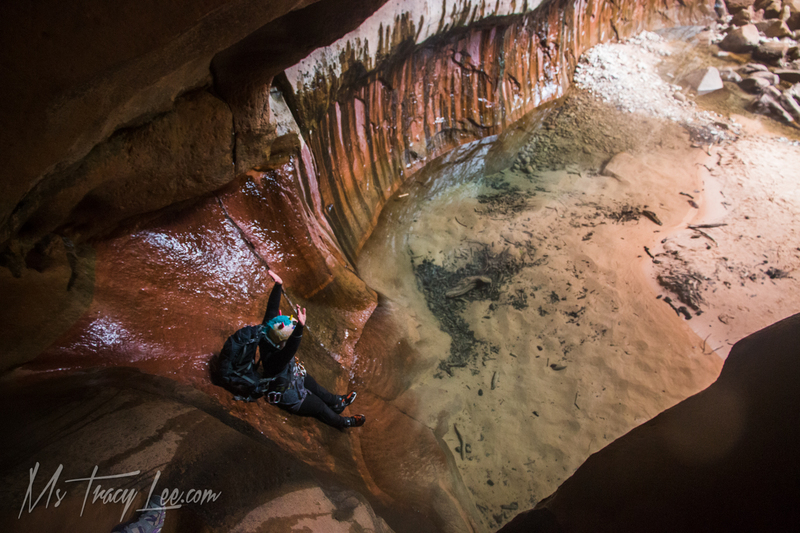 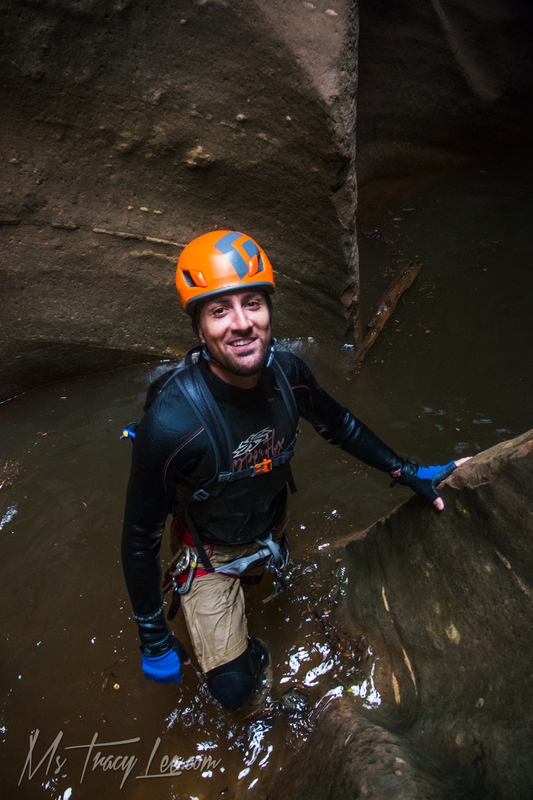 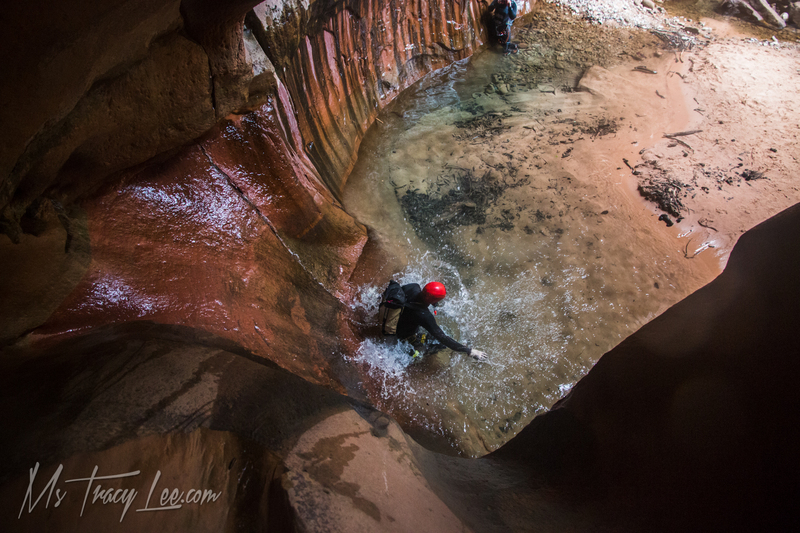 I brought my digital SLR packed in a Dicapac; an underwater camera bag I have used a number of times in the past but never in a slot canyon. 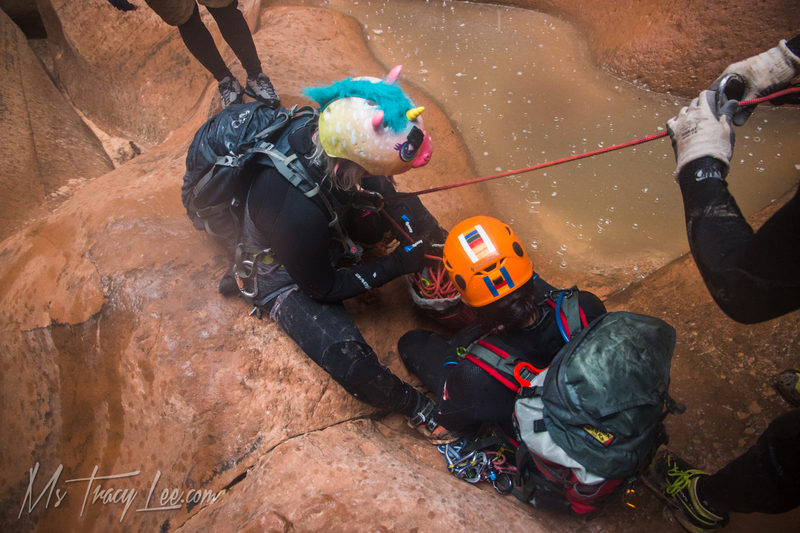 Right off the bat it was into the drink before we even got on the 1st DRY rappel. 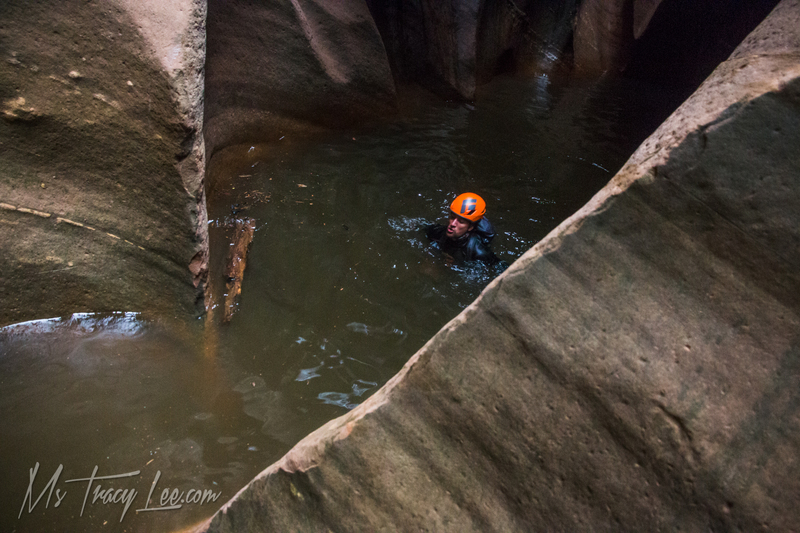 We continued on to the 2nd which was a wet one but only thigh deep. 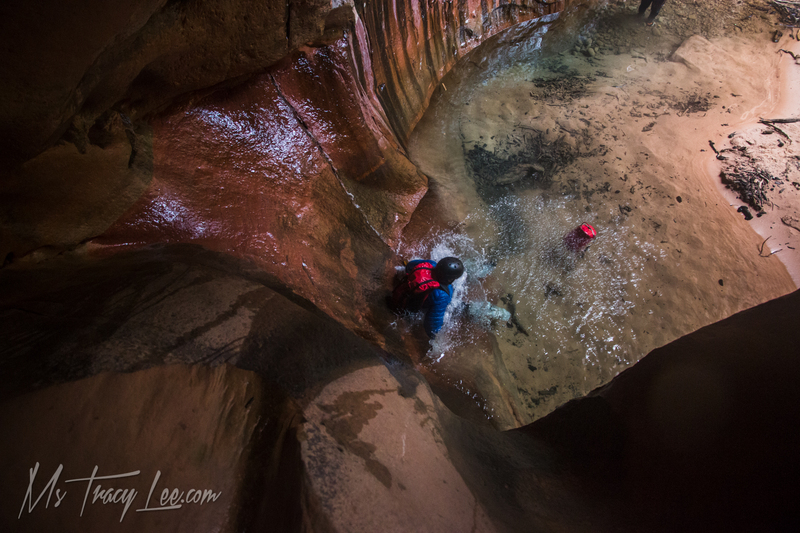 We came an area that most of us slid down but Cody decided to cannonball it! 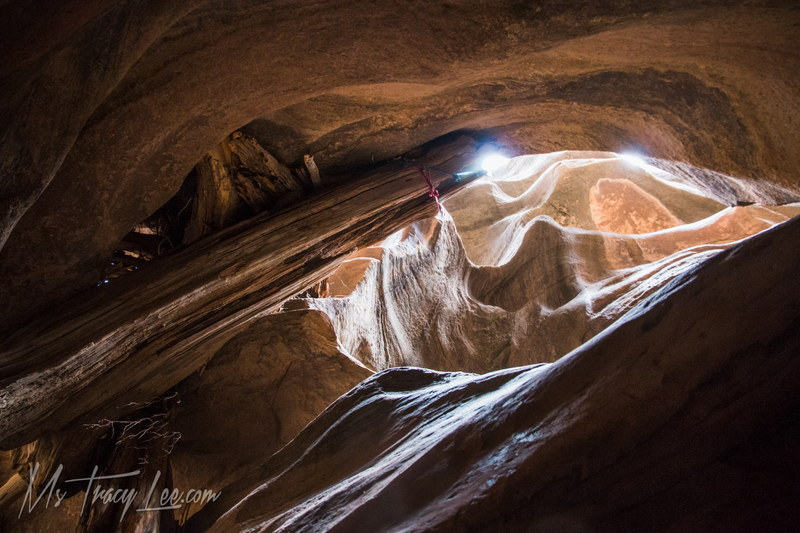 All the while I'm taking photos documenting everything and just blown away by how beautiful it was! 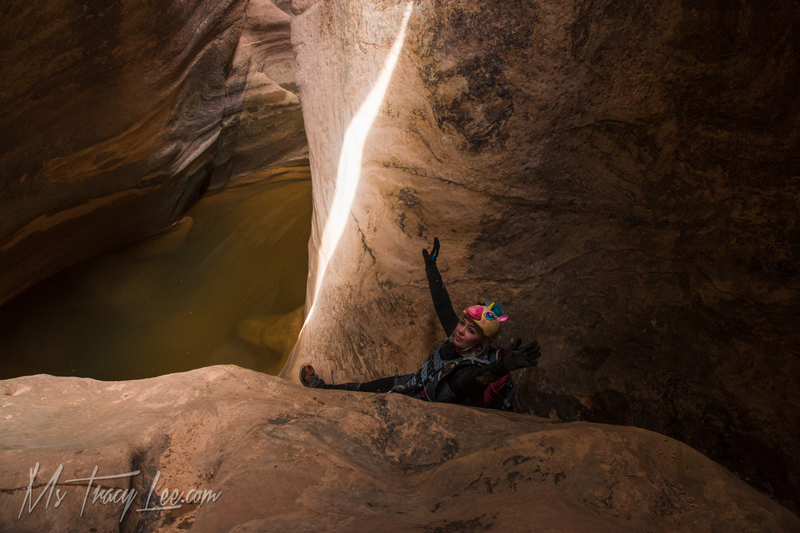 One more super short rap, and we were at the famous Cathedral of Pine Creek. 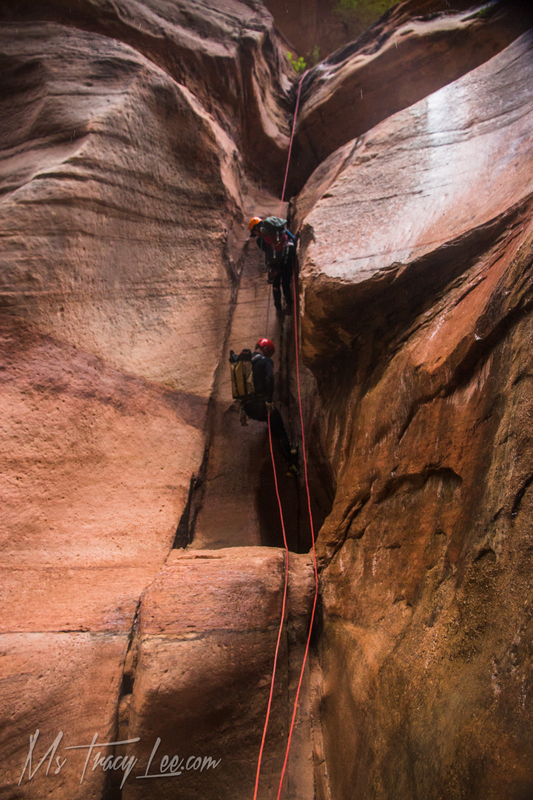 We let a small group of 3 pass us on our rope because we figured our group of seven would delay them a long time. 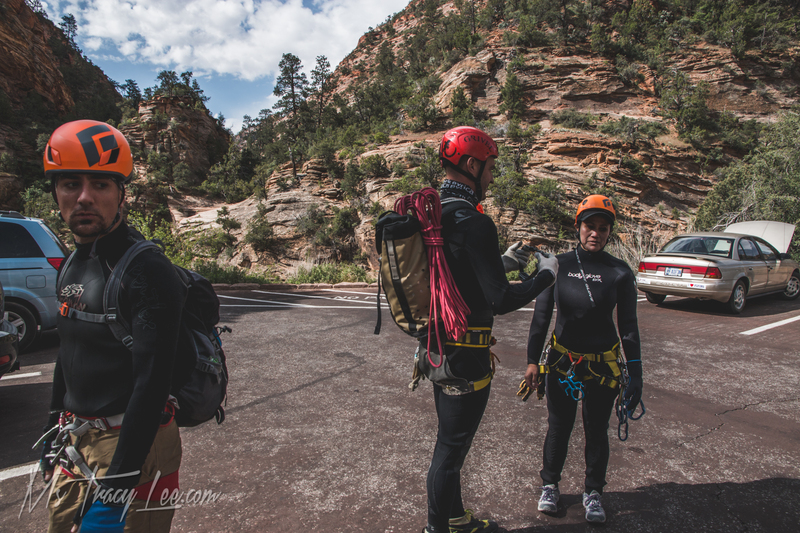 In watching them, they truly didn't seem overly prepared; the 2 guys were wearing spring suits and no gloves and one of them got on rappel backwards so just rappelled with his weak hand instead. 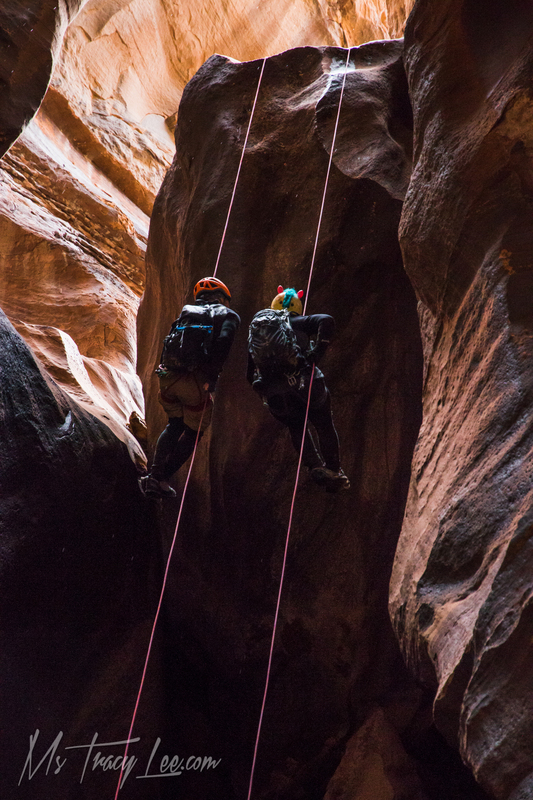 Sarah had gone just before them so she could take photos of all of us descending. 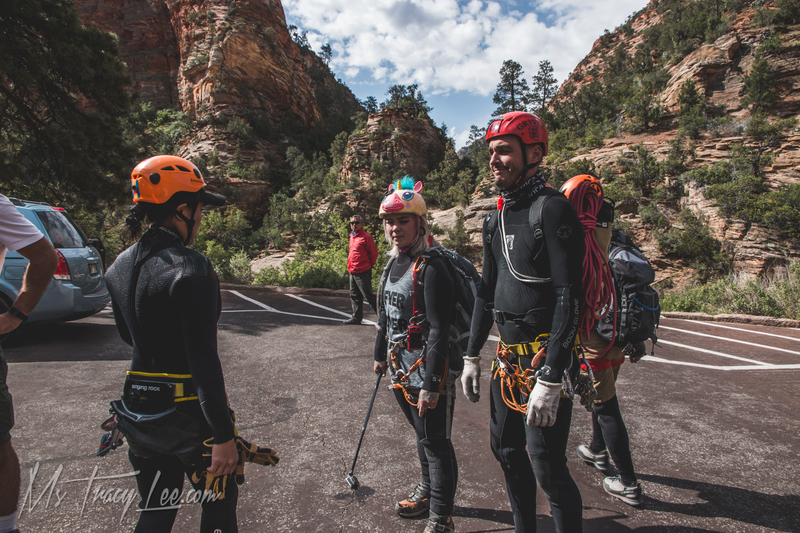 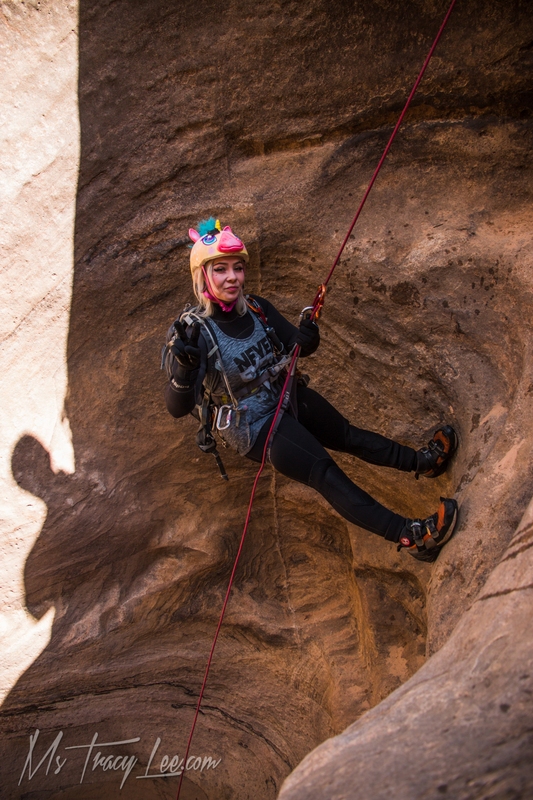 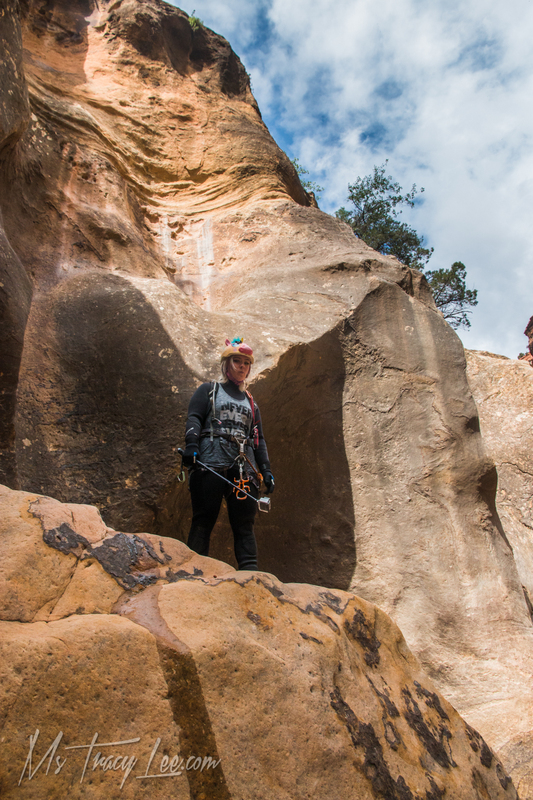 I went 1st after the group and I had to remind myself to take it slow; I have a tendency to jam down a rappel as fast as I can. 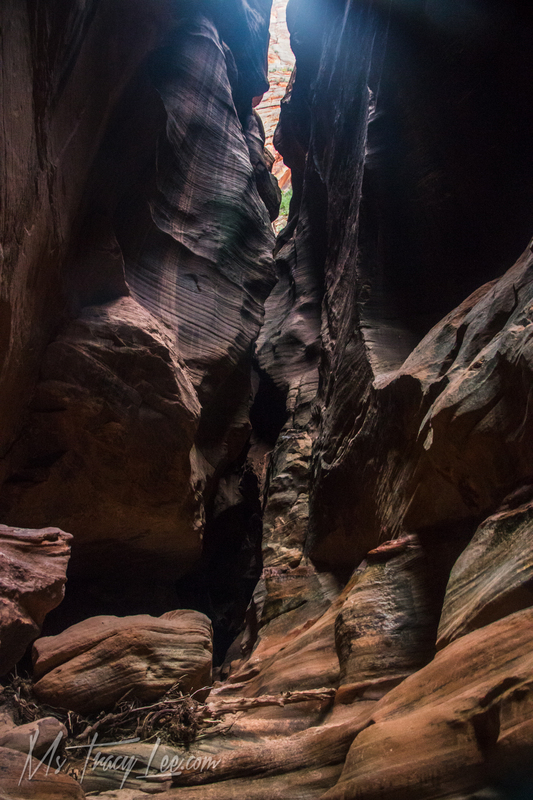 Although dark, the Cathedral still had light coming in from a few different angles. 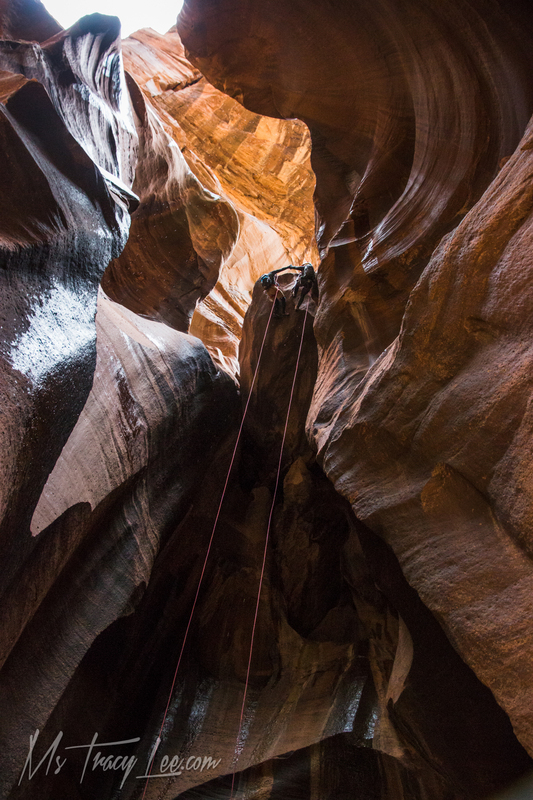 I can't say how enough again how thrilled I was to finally be seeing this impressive canyon with my own eyes; pictures capture it but don't do it justice. 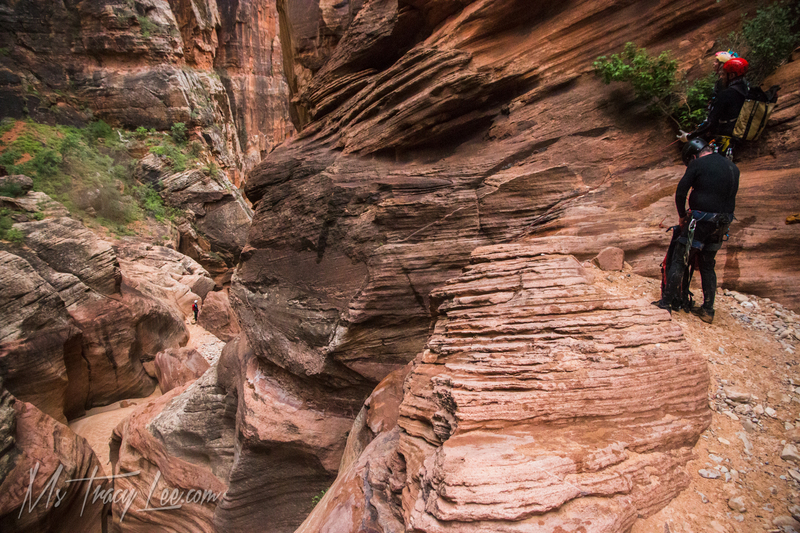 As we made our way through the canyon, rain drops started to fall from above. 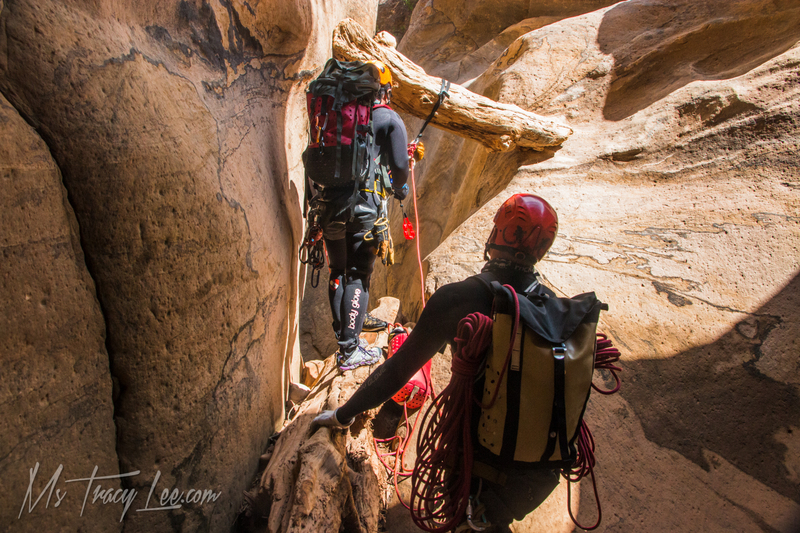 Although the walls of the slot were high, a good amount was falling upon us so the entire group started moving with haste. 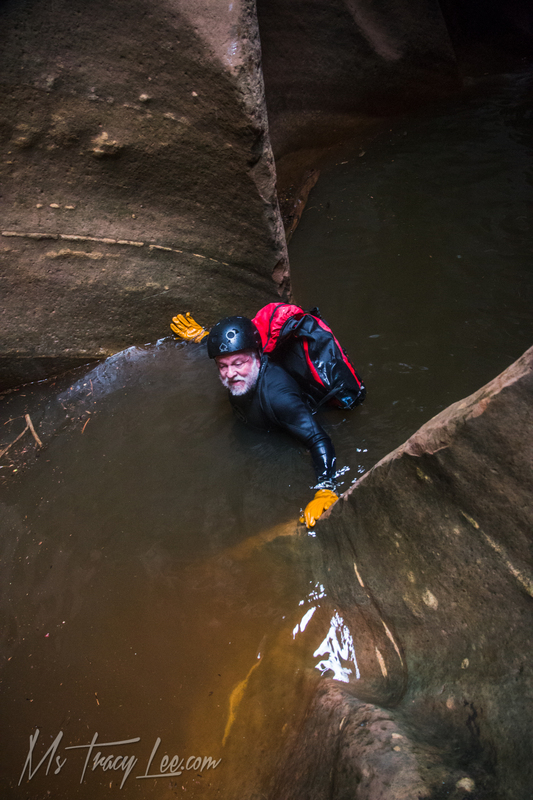 I kept an eye on the water level which didn't seem to be changing at all and it stopped raining as quickly as it started. 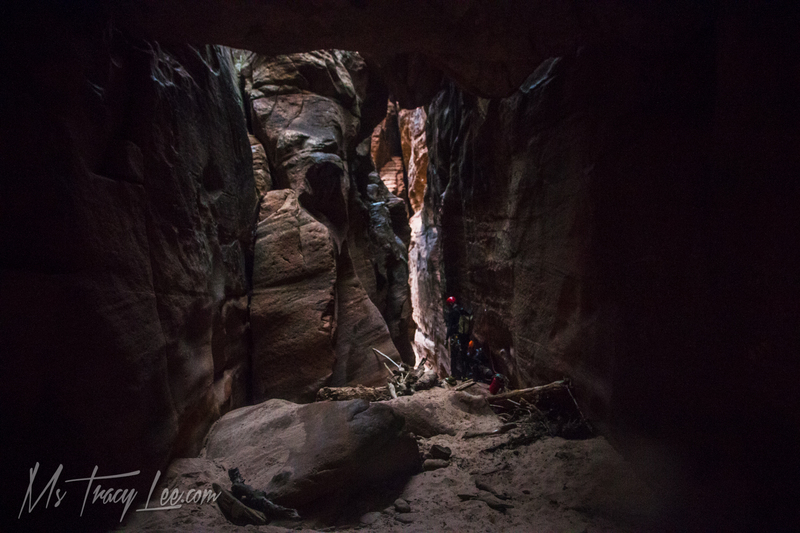 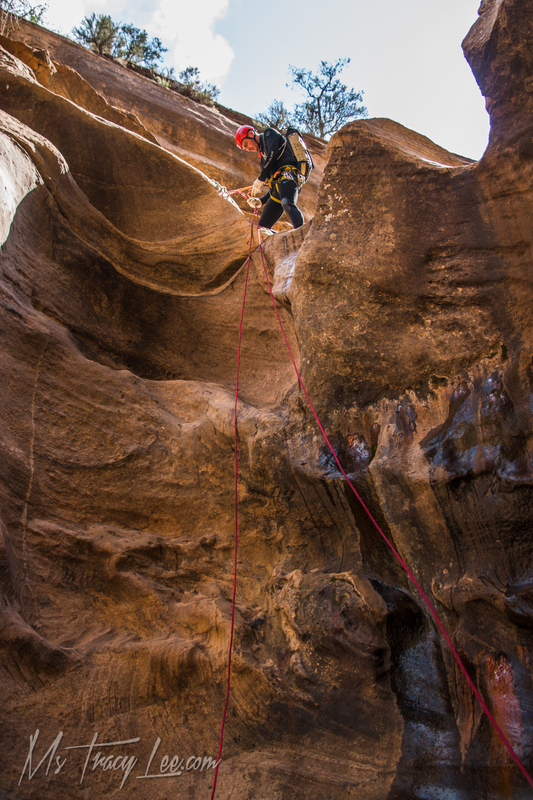 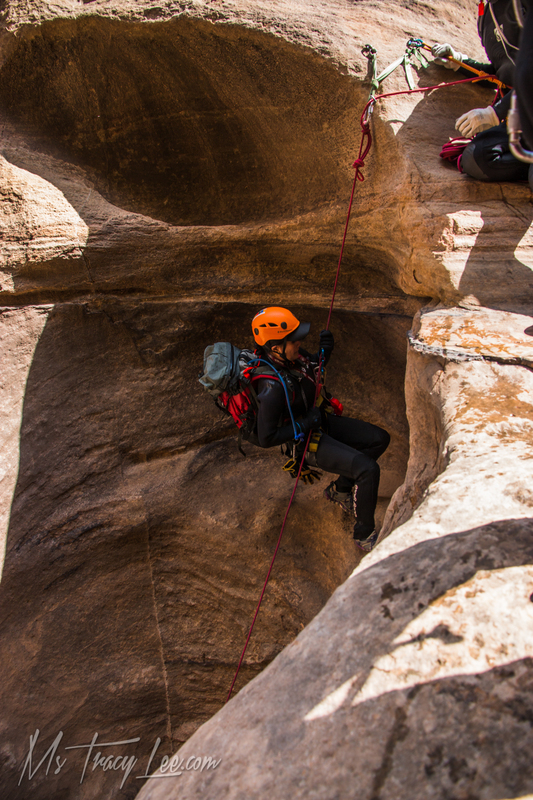 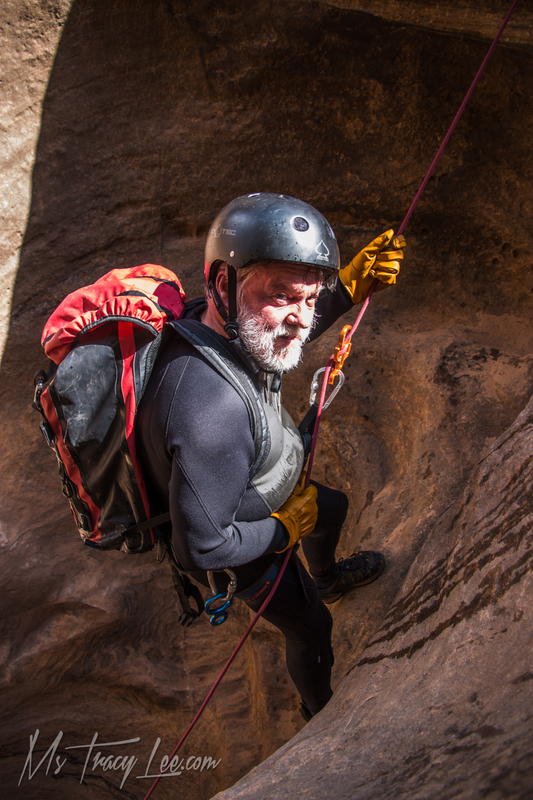 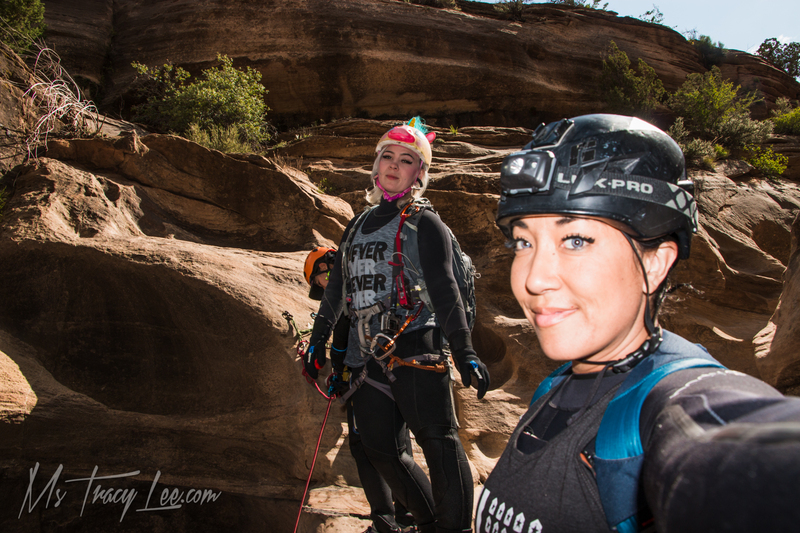 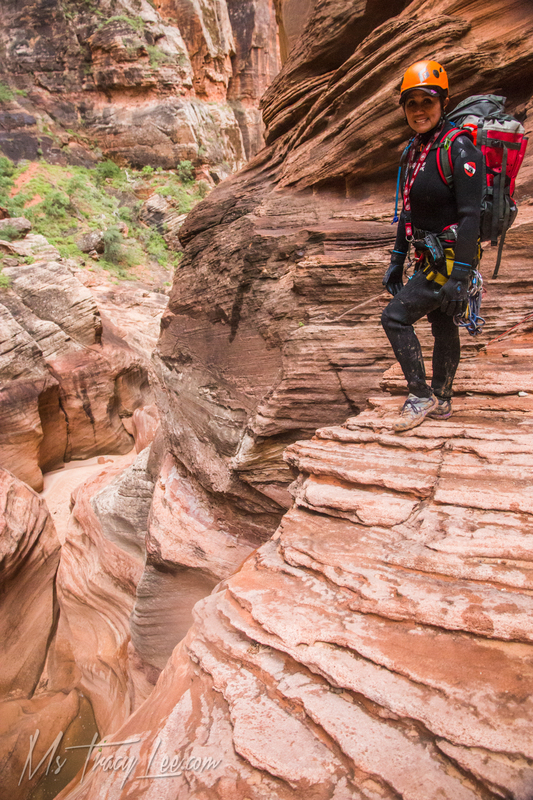 Although we did slow down a little bit, we definitely felt a sense of urgency to get through the rest of the canyon. 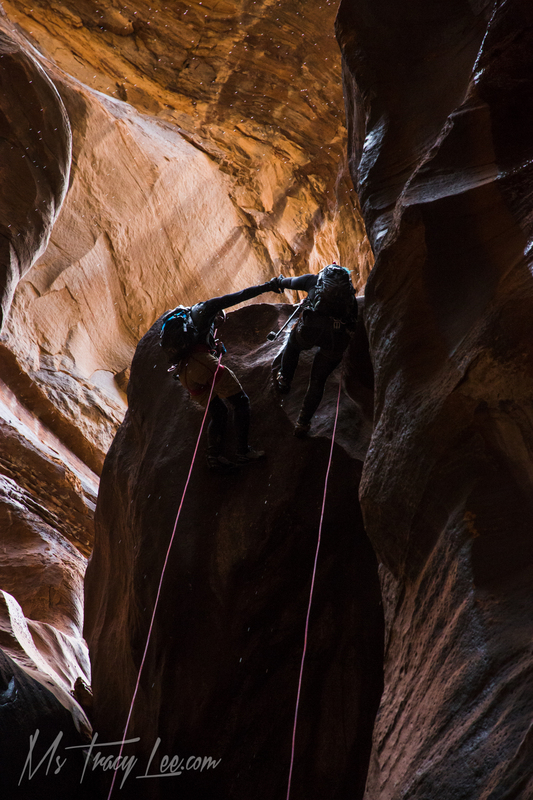 On the final two raps of Pine Creek, Cody rigged them to allow two people to rap at the same time. 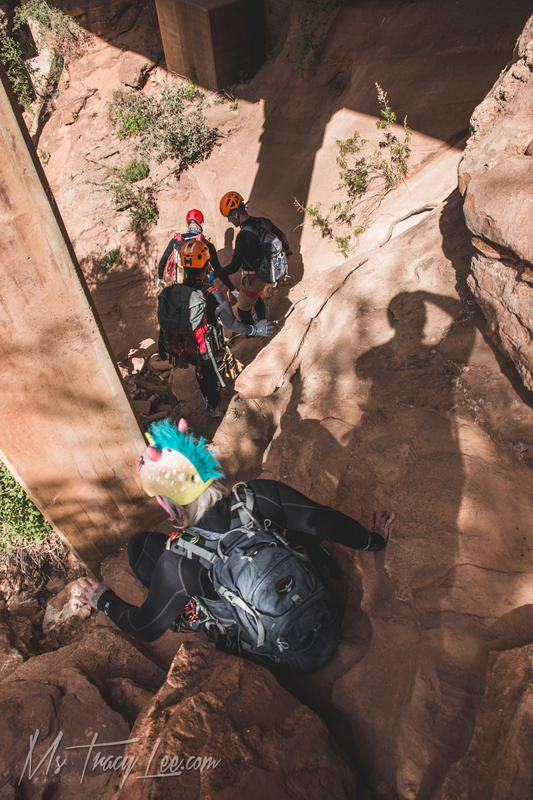 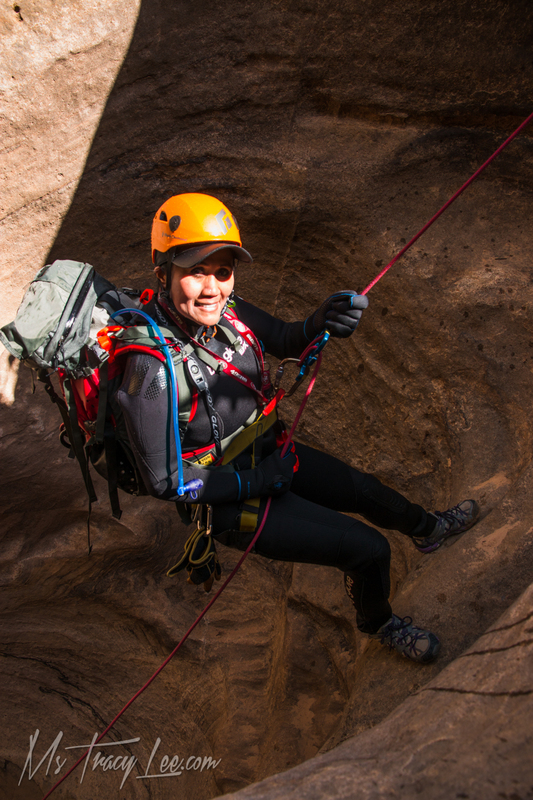 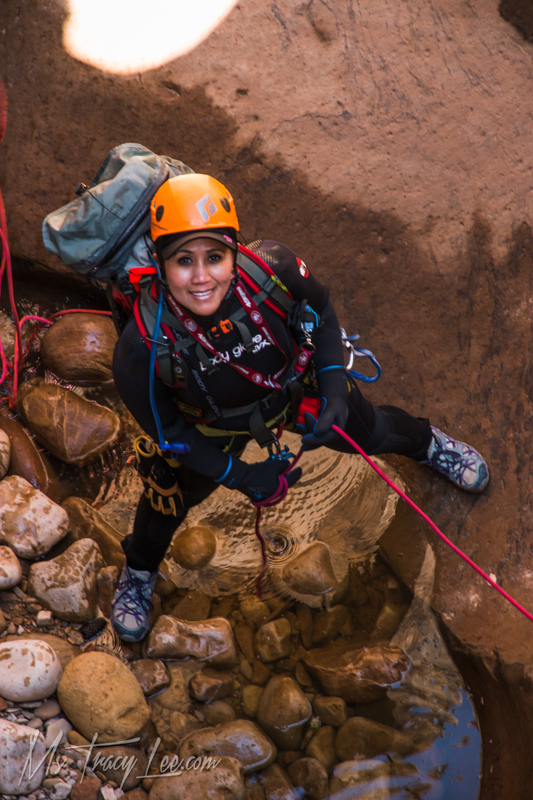 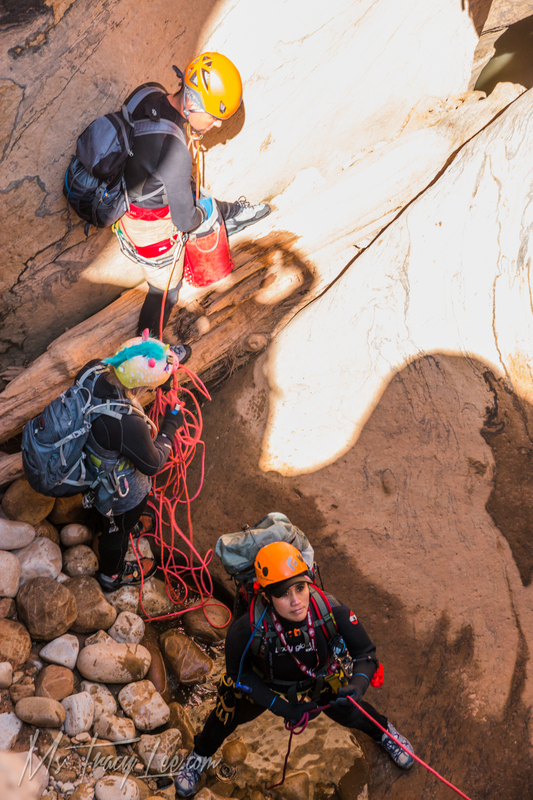 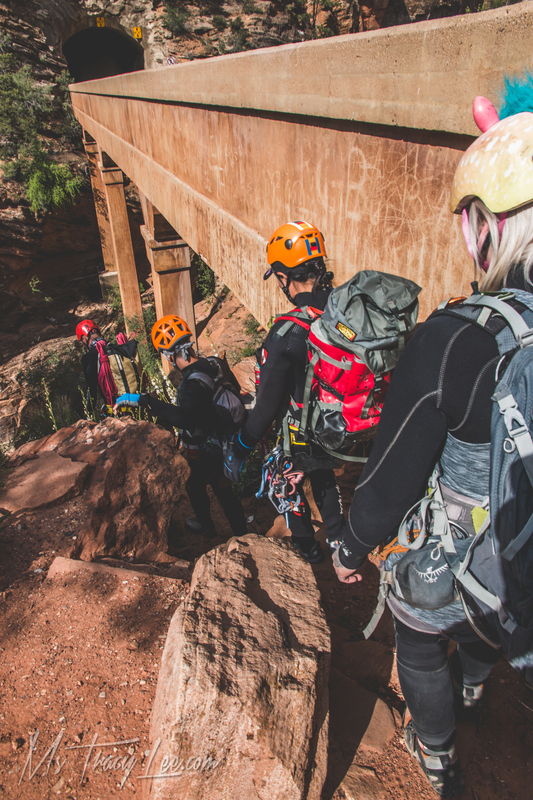 This of course allowed our group of 6 to finish the canyon quickly and efficiently although we still made time for photos; Sarah from the top and me from the bottom. 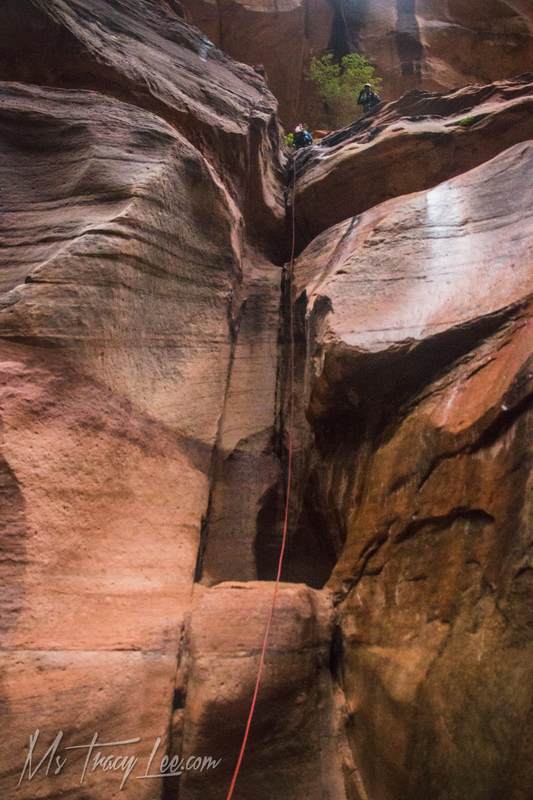 On the final rap, I was just below MJ on the ropes. 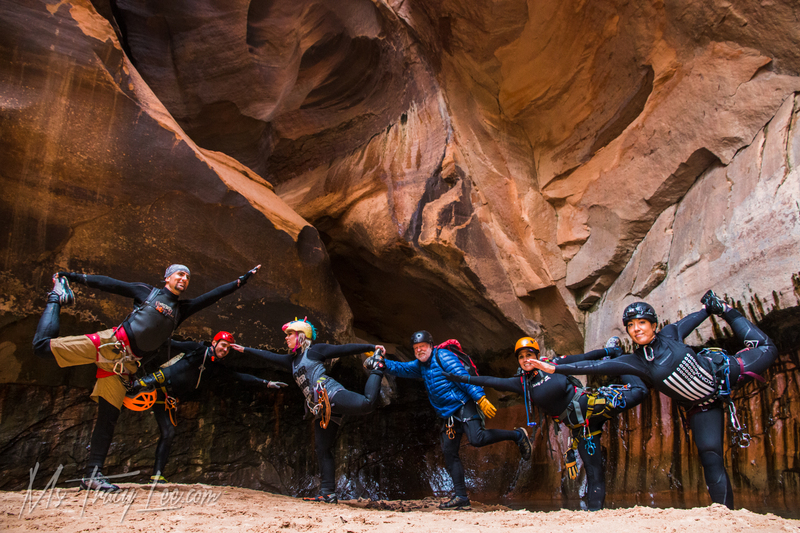 When ropes were bagged, and we were off the final rap, we got this group photo of everyone doing dancer's pose. 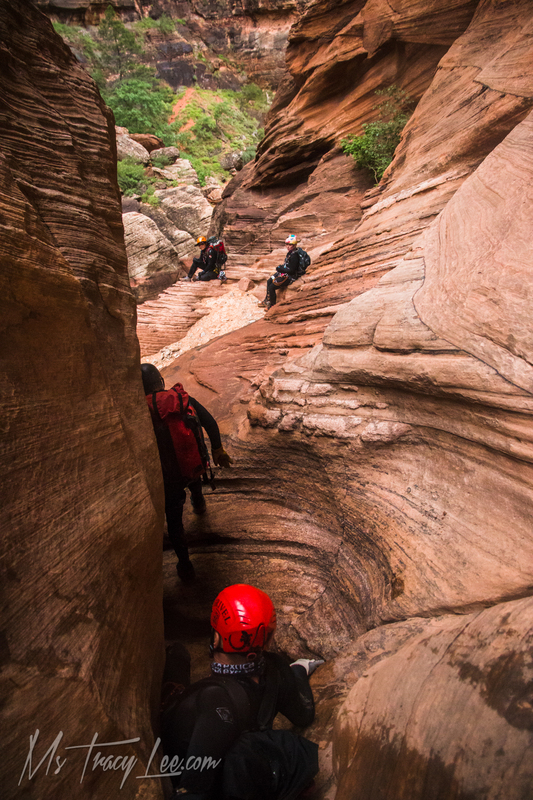 Then we made the downclimb through the wash to the shuttle point. 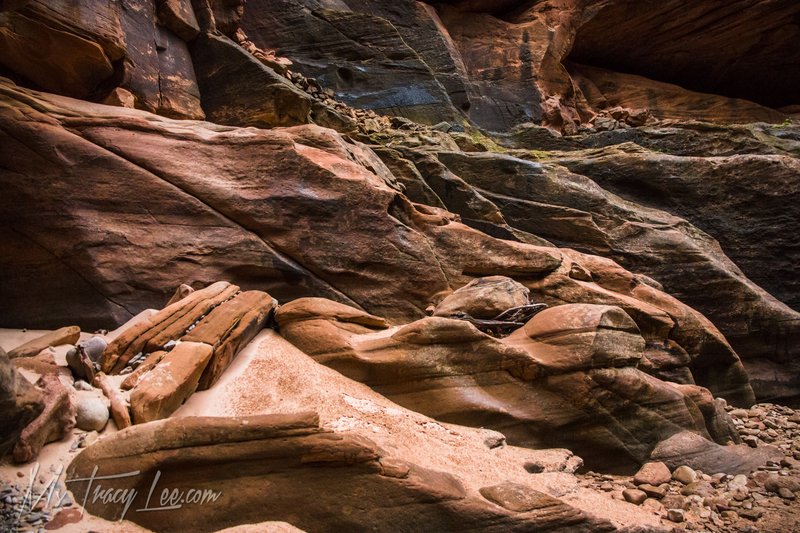 There were a lot of partner assist opportunities through here. 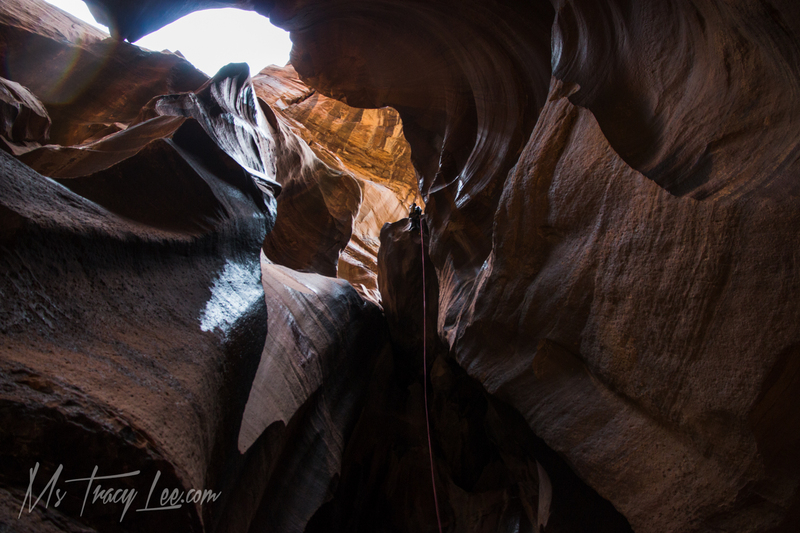 We continued as quickly as we could because although we were out of the slot, it was close to noon and the clouds were showing more than the original 25% chance they were expecting (turns out the NOAA upped it to 50% while we were in canyon!). 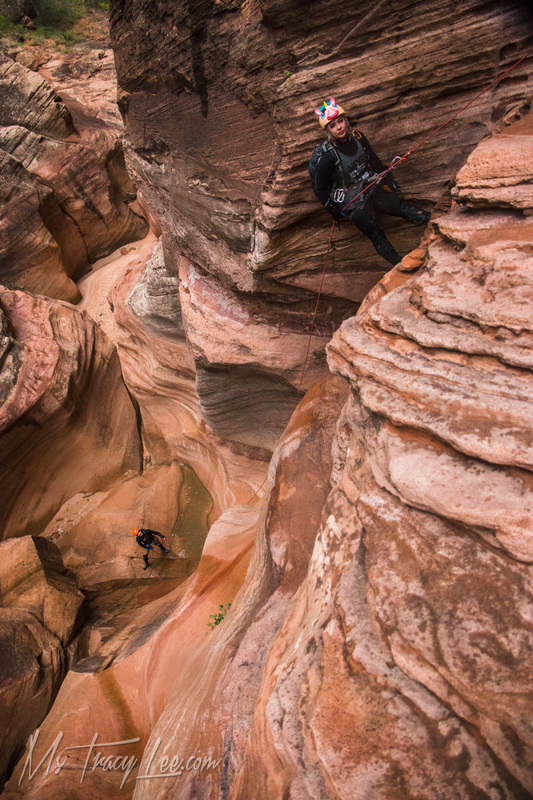 We found ourselves climbing out of the wash onto the main road right around the time that the skies opened. 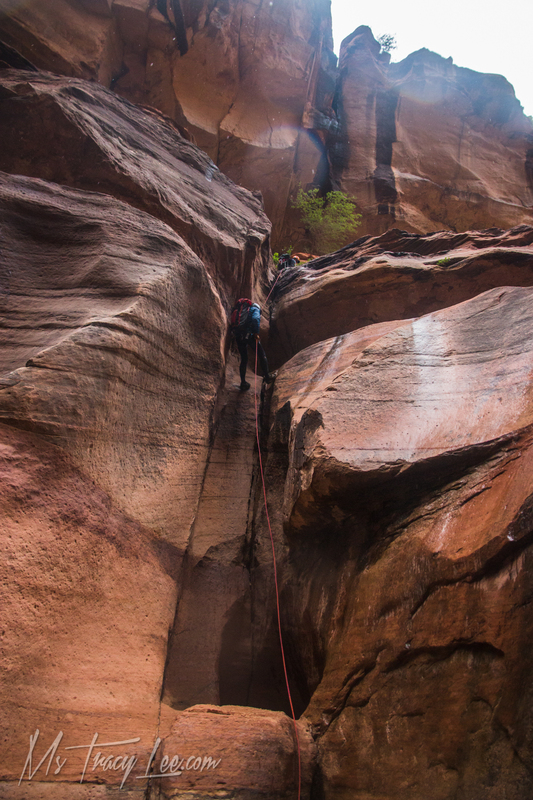 We joked around about it being a perfect time to do Keyhole when in actuality, we were thankful that we chose to do Pine Creek first and Keyhole second if the weather allowed. 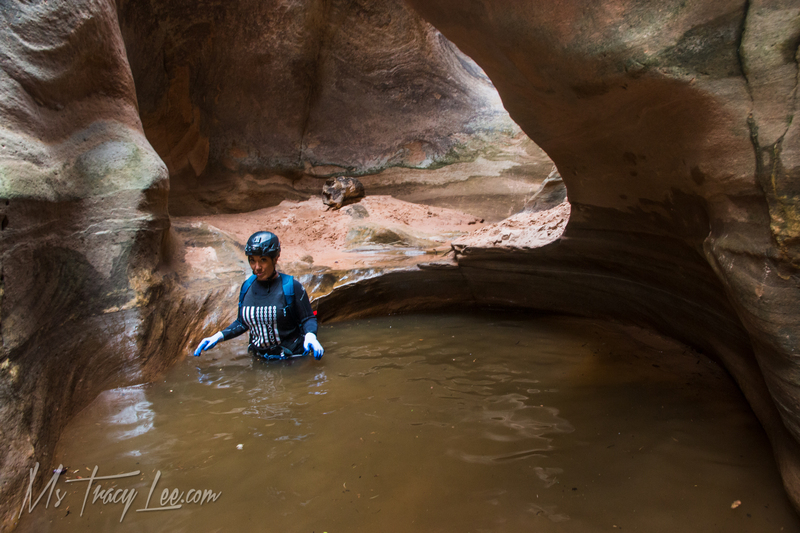 If we had done it the other way around, we would be somewhere in the middle of Pine Creek in the downpour that ensued. 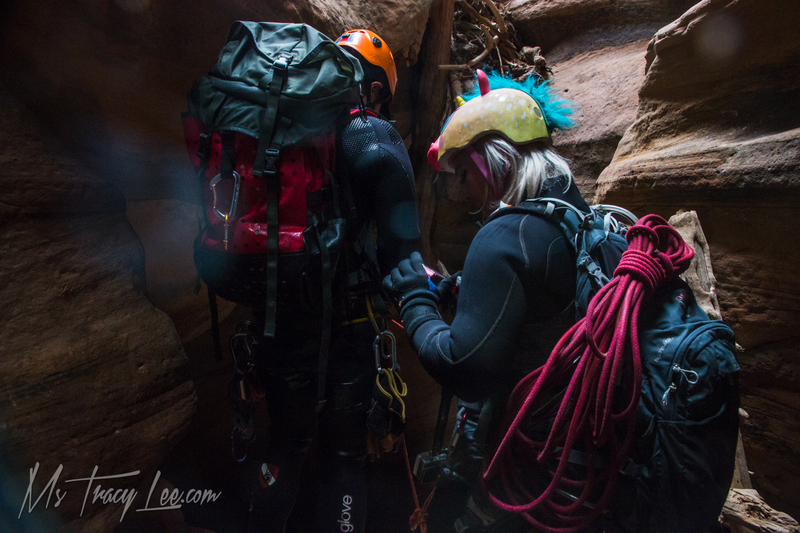 I don't know if it ended up flashing that day or not, but I do know that we made it out safe and sound. 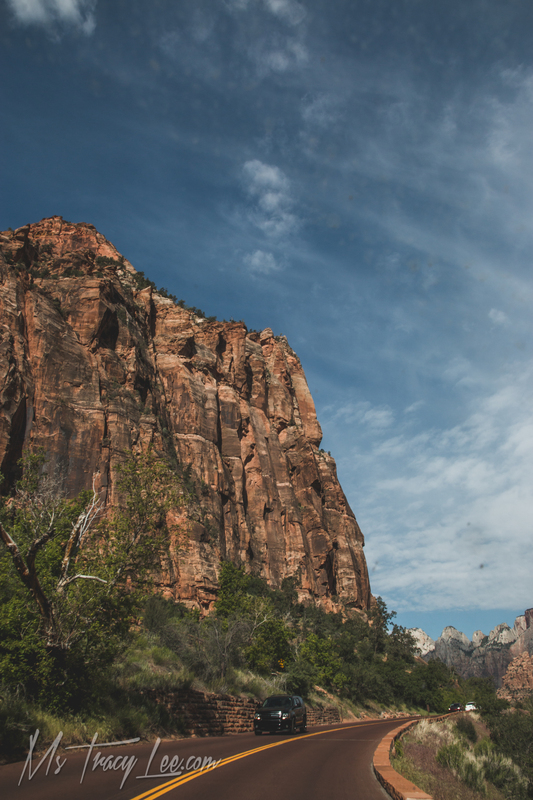 Somehow the shuttle car key had gotten left at the top in Jack's car so Jack ended up hitching a ride from a generous tourist. 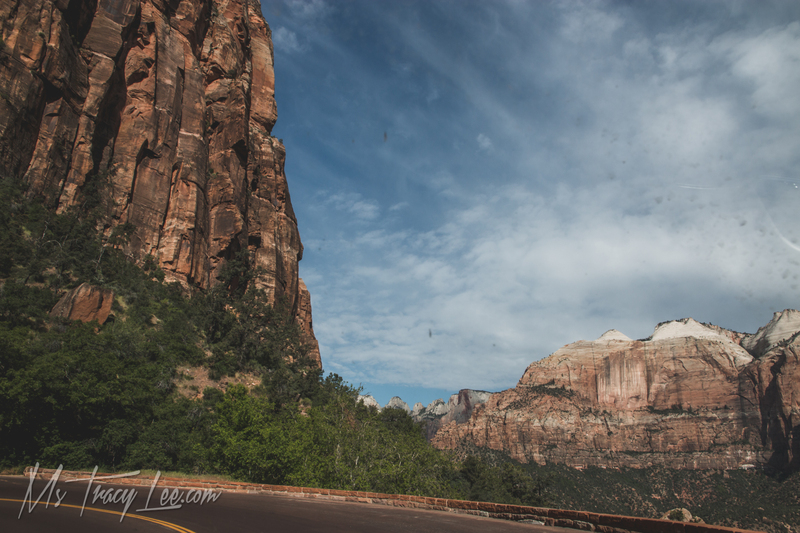 We sat there waiting in the pouring rain, and I waved and smiled at every single car that drove by; almost every single one waved back! 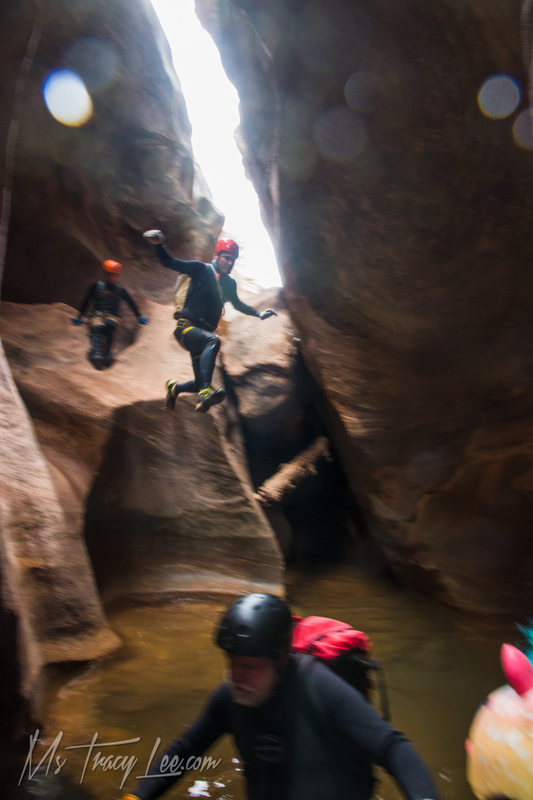 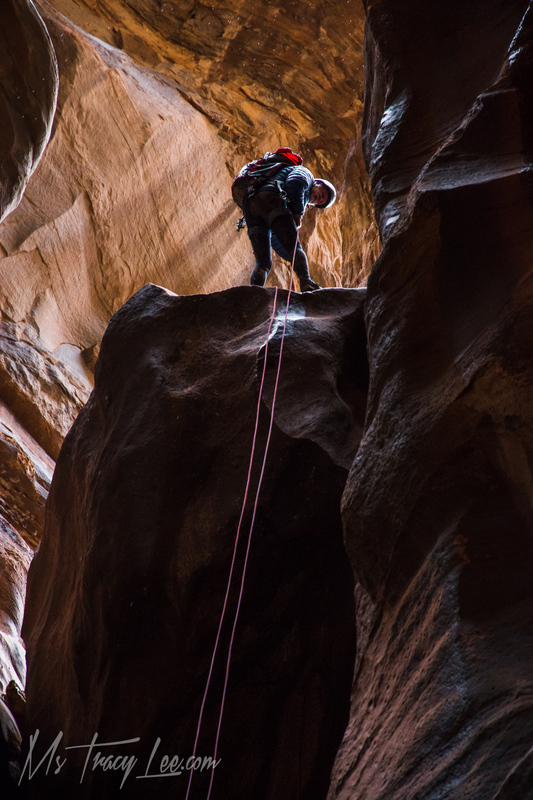 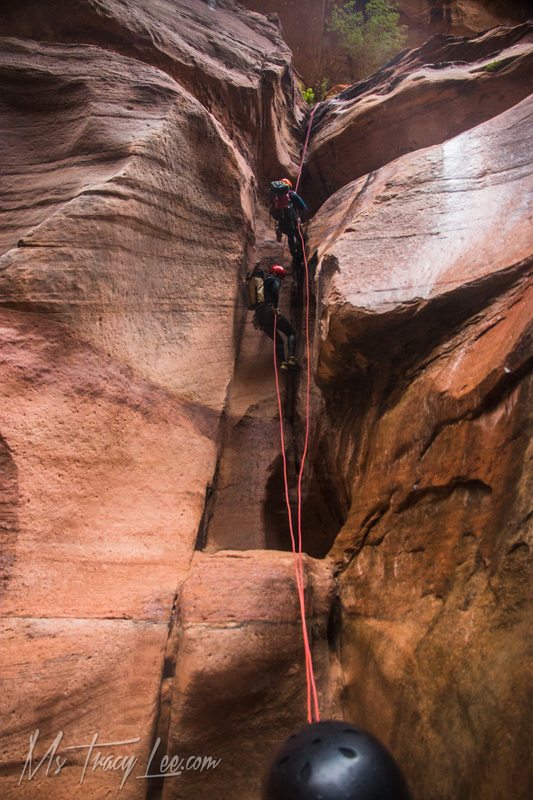 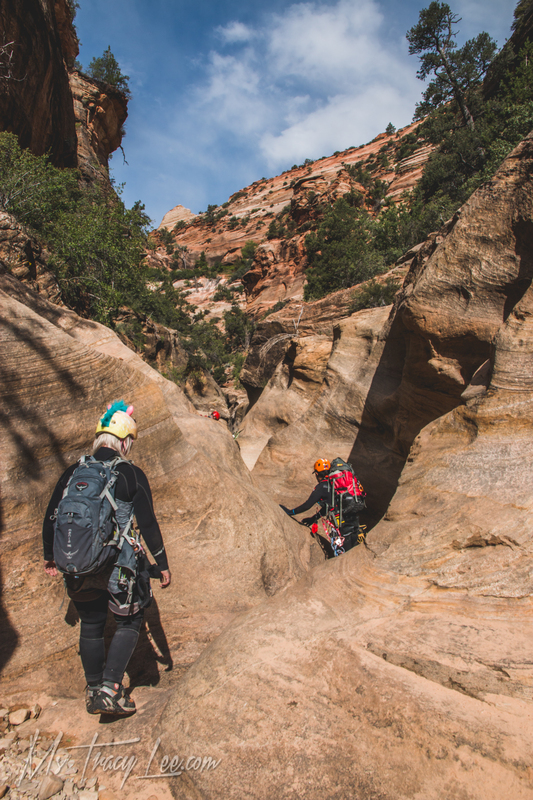 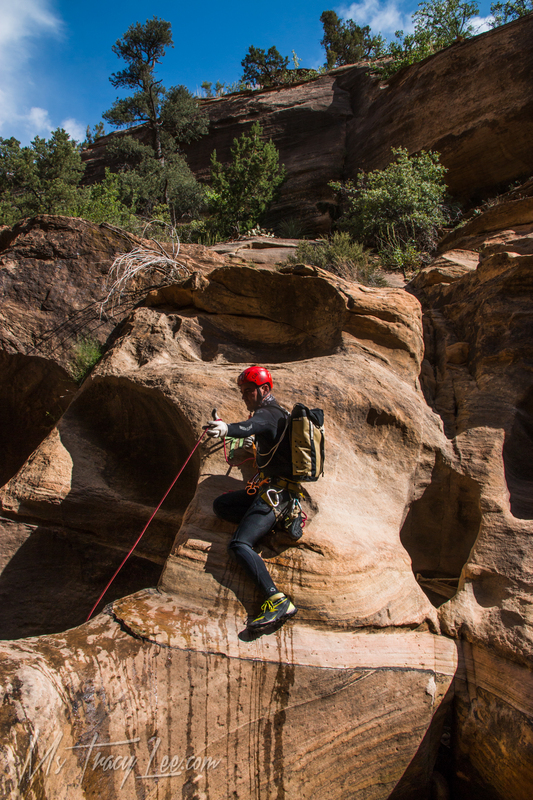 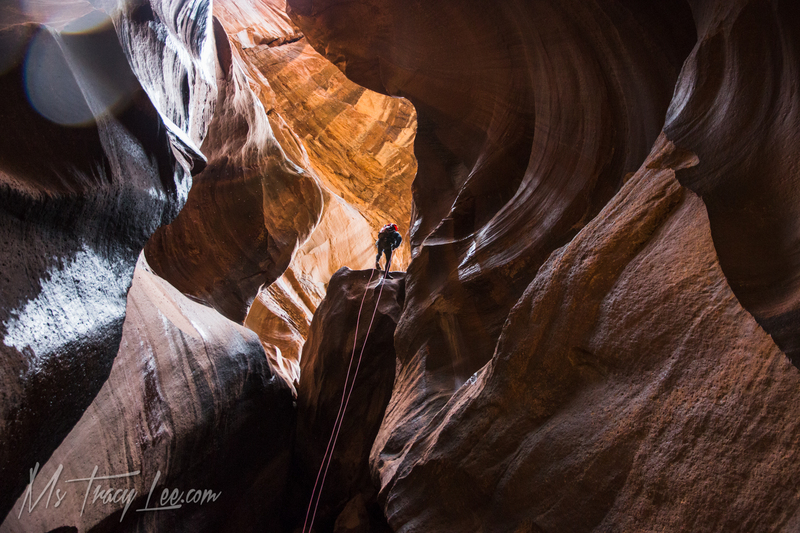 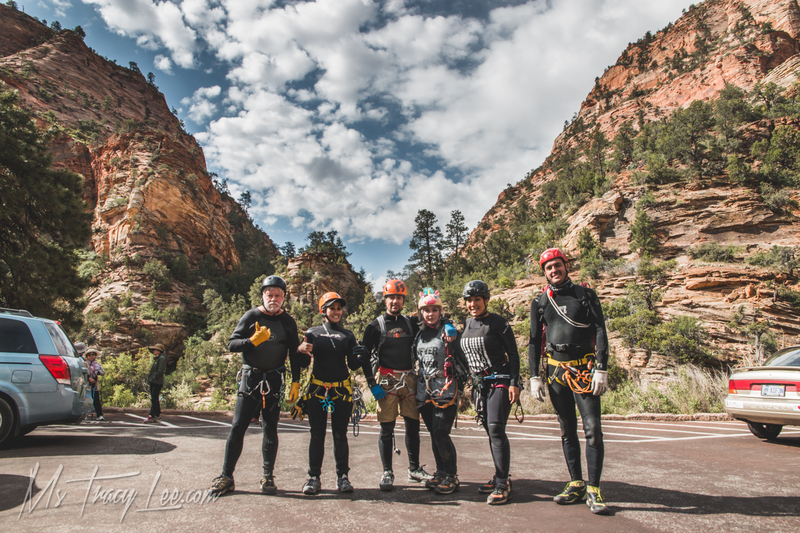 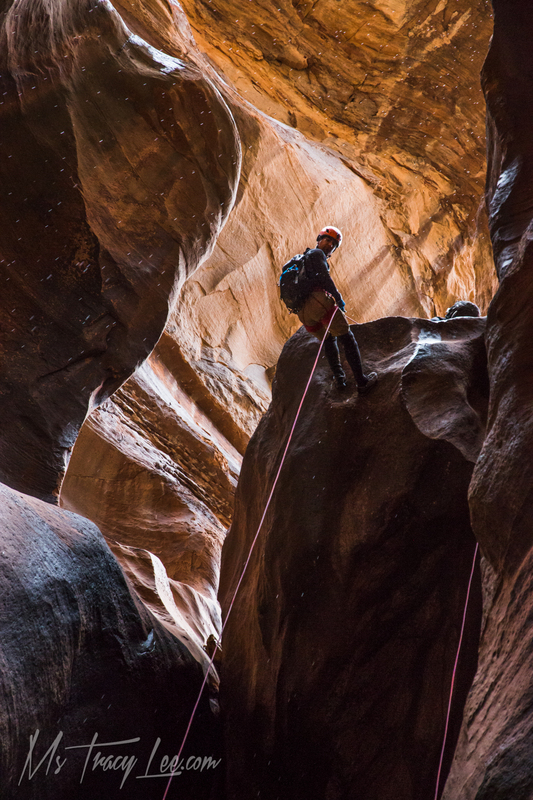 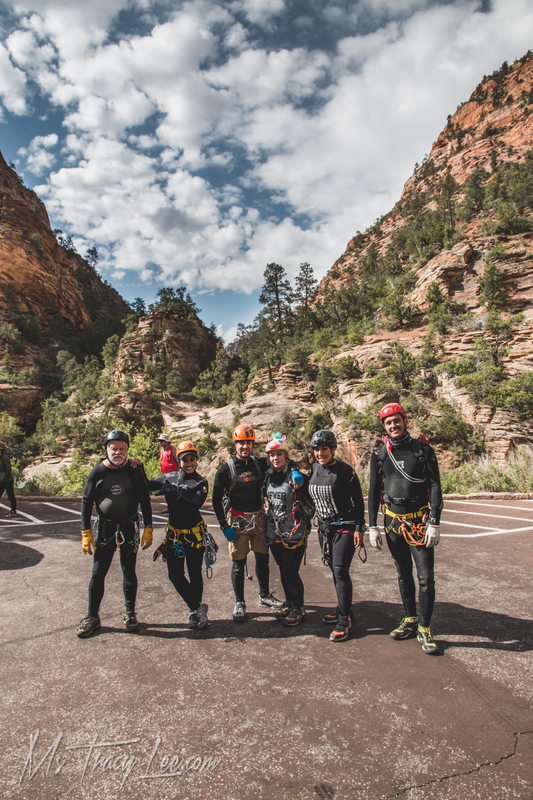 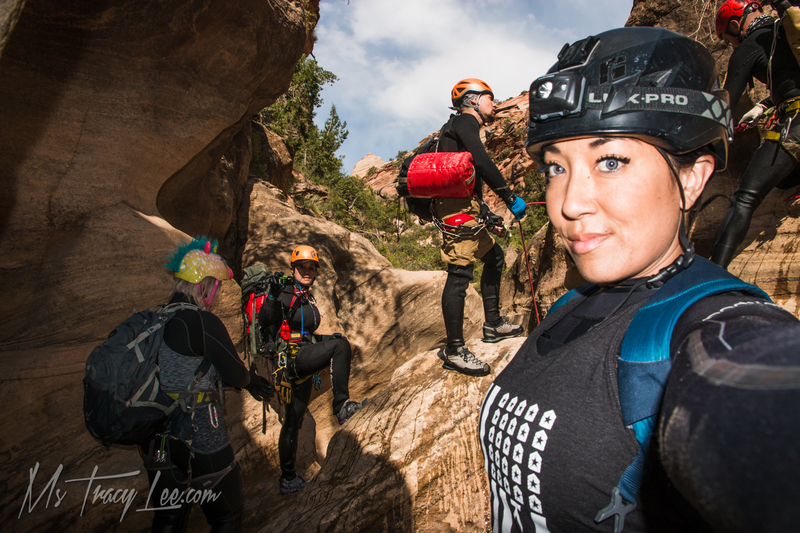 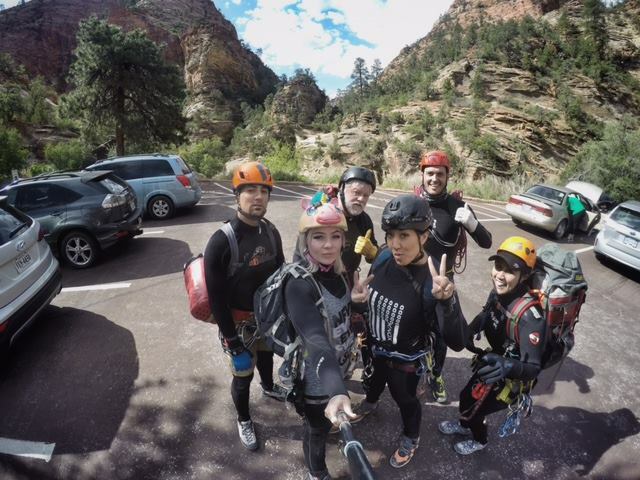 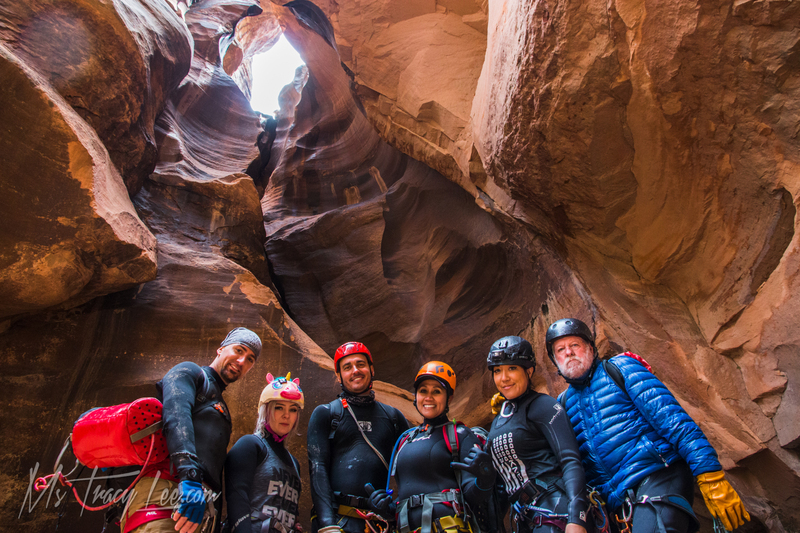 Thank you to Cody, Sarah, MJ, Marcus and Jack for the awesome day in a beautiful canyon at Zion!